Read The Story So Far! 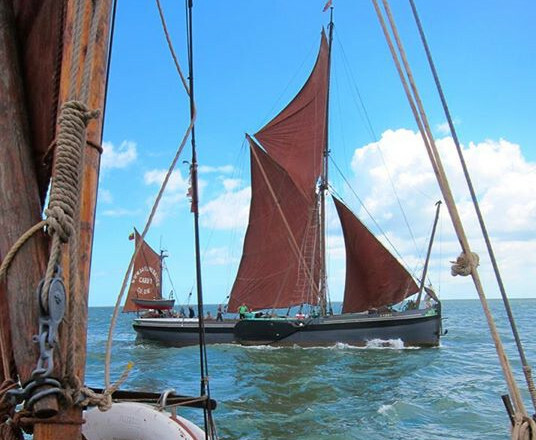 The barge owners and the sailing barge community do a gallant job of keeping these vessels maintained and in good seaworthy sailing condition, but there are times when this self preservation takes it toll on their personal pockets. 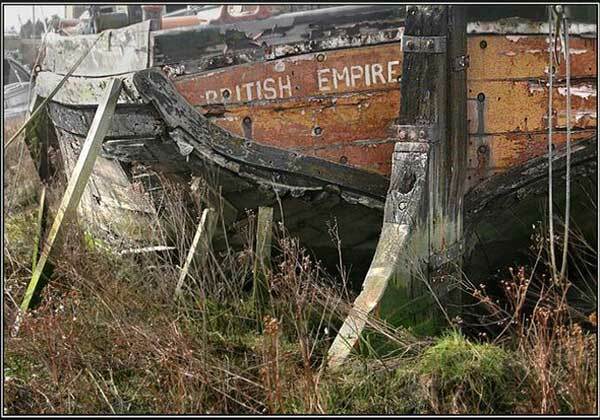 Trying to keep alive such a Great British icon and historical artefact, of a period when Great Britain was known as an Empire, the British Empire, is a mammoth task for the community alone to upkeep. It needs help; public help. It needs sponsorship, advertising, grants and donations. 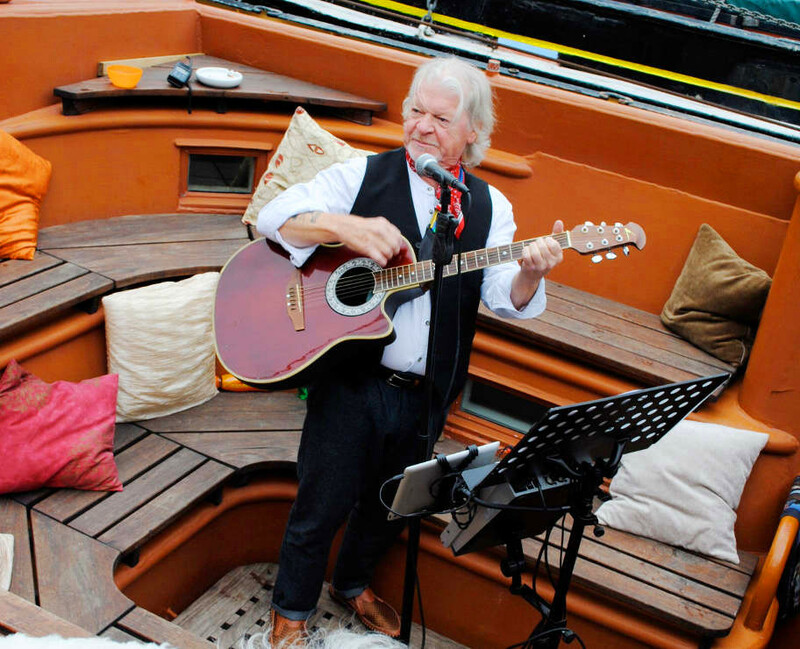 Prior to a chance meeting, I, Jonathan Fleming, was invited to look after a friend's new house boat (a 150 foot Dutch barge) which had three bedrooms, a lounge, an open plan kitchen and a bathroom/utility room. I had never been on a personalised boat before and indeed knew nothing much about boats at all, so this was novel to me and given that the barge was moored in a working boatyard, there was plenty of fascinating sights to feed my imaginative mind. The first thing that got my attention was the number of wooden boats that looked like projects in various stages of repair or restoration. I had no problem with this, but it crossed my mind that each afternoon when I set out down the jetty and across the yard to the fields where I walked the dogs, activity on those projects I passed, was not very evident. I expected to see lots of young apprentices and skilled boat builders working on these projects, but the yard didn’t seem to have much young blood about and I wanted to know why. The reason for my concern here, was that the media had been reporting apprenticeships were lacking in the field of boat building, yet the work looked aplenty to me. I needed to question someone, but I didn’t know who. 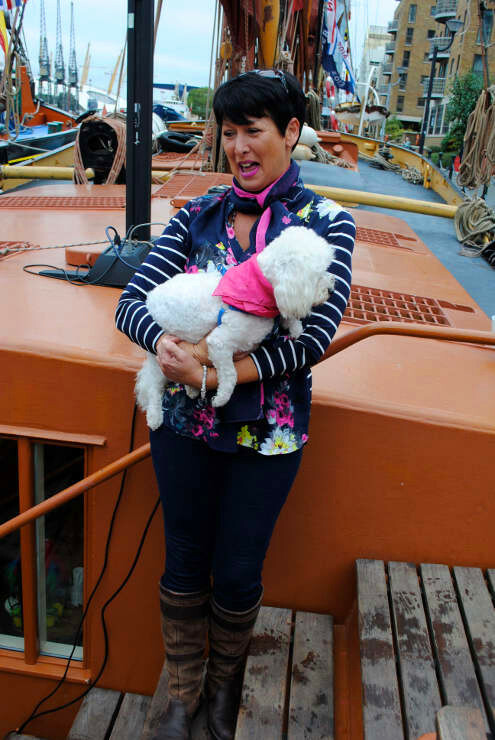 Then the day came when I was able to pose that question thanks to the four dogs between us bringing me in front of the boatyard owners, Andy and Jane Harman, from whom my friends Dutch barge was brought. We got talking about all the projects that were sitting in the yard and why new apprenticeships were not being taken up (all of which came down to funding — the lack of). Then seeing that I expressed an interest in his industry, its welfare and establishing that I didn’t just see rubbish, Andy invited me to have a look at the project he was working on. 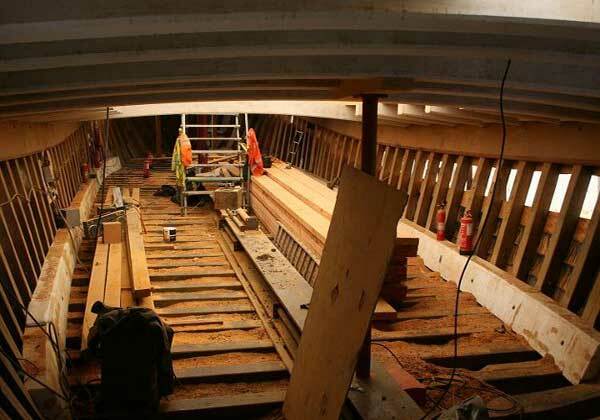 Next day I turned up to view what I learned was the sailing barge Edme, de-rigged and undergoing some heavy maintenance, we got talking more about the problem of funding such a project, but that, however, wasn’t Andy’s priority — he wanted someone to get under the barge and anti-foul it. Although he knew I didn’t know anything about boats, barges or even sailing, he wondered what I was made of and offered a proposition. “...Well, If you really want to know what this is all about and you get and do a good job on the anti-fouling, we’ll take you out sailing. You ain’t gonna understand any of it until you go out sailing. Come sailing with us and see what you think, then ”. Intriguingly, I agreed, did my job and then some. A few weeks later I was asked if I wanted to crew at the first race of the season in 2015, Medway. 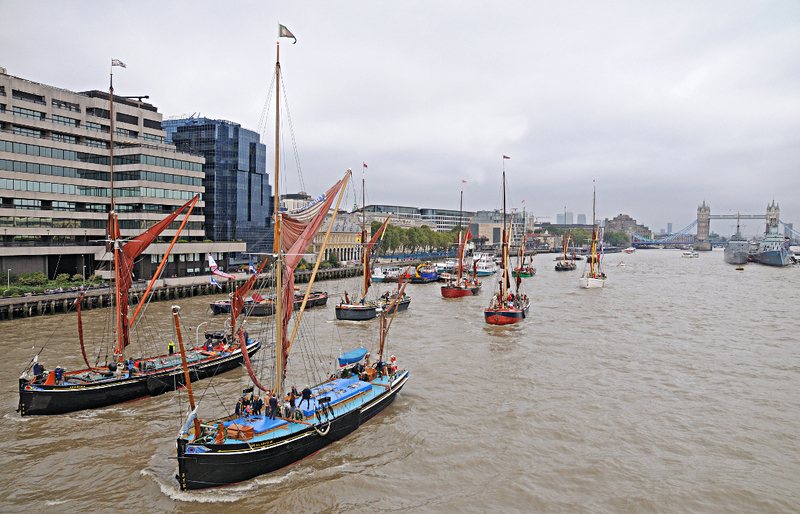 I expected hordes of people watching from the shoreside and loads of boats (well, that’s what I thought they were at the time, but I address them properly now as Barges, specifically Thames Sailing Barges), all lined up ready to race. The total wasn’t very many and in Edme’s class (Bowsprit), she was racing only one other — Adieu. I was shocked. Shocked for both the numbers that turned out shoreside to watch and shocked for the number of entries, however, you have to keep in mind I knew nothing about the world of boats, let-alone, Thames Sailing Barges, what they did or even that they were attached to an amateur sport because of what they used to do in their working days (the barges used to compete against each other, unofficially, to see who could pick up and drop off the most loads, which later turned into sporting barge matches that are part of their tradition to this day). As far as I could tell, the event needed better publicity, more marketing and PR around it, but I reserved my hastened judgement for the next time. I was told, the next match was going to be much better, better turn out, better race, more in our class and so on. The next match I went to was Pin Mill. Yes the numbers were better, yes, there were more in our class, but again shoreside, the turnout was not really there. By now I was starting to notice a real problem; shoreside viewing. Even if the crowds did turn out, they would only be limited to seeing the start and finish, the rest of the time the barges are way out to sea where no one can view them unless they were on some other vessel or that they were being televised in some way, which they weren't. For most of the matches thereafter that I attended (Meadway, Pin Mill, Swale and Colne), that problem was pretty much what I saw. In my mind I thought, “perhaps the lack of viewing public is part of the wider problem of funding”. I couldn’t see major sponsorship coming in, unless they were able to get something out of it. Given the limited exposure, it seemed that wasn’t going to happen anytime soon. Exposure… that is what I then turned my sights to and thought, “if something could happen where the public could have land access to easily see all of the barges while they were sailing, I think people would turn out for that...”, I held that thought for a bit, switched to another, which was to figure out where that could be done, then switched back again to continue on from where I left off, I came up with, “...London, that’s where you could do that, on the river Thames, but not a race, a parade”. I asked Jane if there were any matches that were on the Thames and she said no, that there was a match called the Thames Match, but it wasn’t actually on the Thames any longer. I asked why and was told in short, too many restrictions and other problems. That to me became the challenge, to get the barges sailing up the Thames, through the Thames Barrier, into the Pool of London, past Tower Bridge, with its Bascule drawn up and further on up the river. Putting that Idea to Jane she informed me that the barges could not go any further than the Upper Pool because of the low bridges (I didn’t even know what the Upper Pool was at the time — for those who don’t know either, Google ‘river Thames Upper Pool’), but if that was as far as the barges could go, for me, it was enough of the south and north bank where thousands of people could view from, to still pursue as an event. I knew then that the only way for such to happen was to talk to officialdom and so I began my quest. The first person I wrote to was the Mayor of London, then Her Majesty The Queen, then the PLA (Port of London Authority) and through this endeavour I got replies, enough to lead me to the one person I wanted to get to in the first place… pageant master of Her Majesty The Queen’s Jubilee Pageant 2012, his name: Adrian Evans. Adrian Evans was of particular interest to me because he had already done something akin to what I wanted to do with the parade, so I wanted to find out from him how to do that or better still, do something with him. The latter persisted. letter to the Port of London Authority. Though I never received a reply from PLA, we managed to see them later (upfront and personal, backdoor style) through that contact with Adrian Evans. In my search to understand the leads I had been given, I read up on the fact that Adrian Evans headed up an event called Totally Thames which celebrates London’s river from the 1st-30th September with events galore, sponsored by the Mayor of London and promoted by Thames Festival Trust of which Adrian is the director. 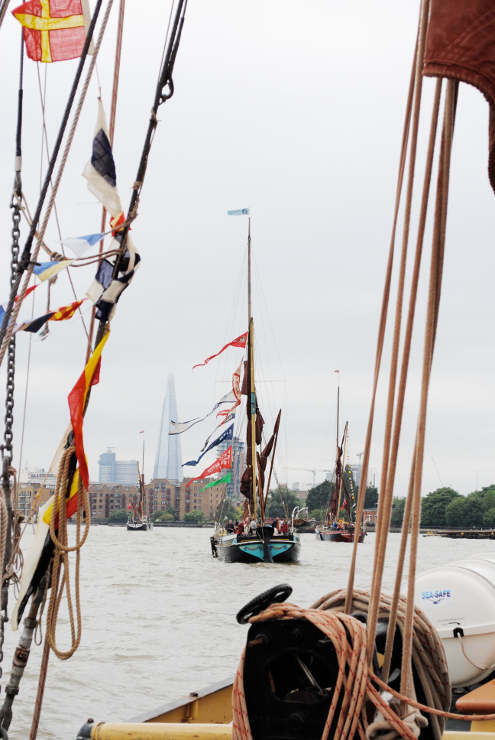 But my search also revealed that this event had nothing to say of Thames Sailing Barges, yet the address of Thames Festival Trust is: Barge House, Barge House Street, London, SE1 9PH. I had to get in contact with this man and find out if we could be included as one of his events and when I did, I was surprised at how fast the positive response was to my initial contact — just 7 Hours. 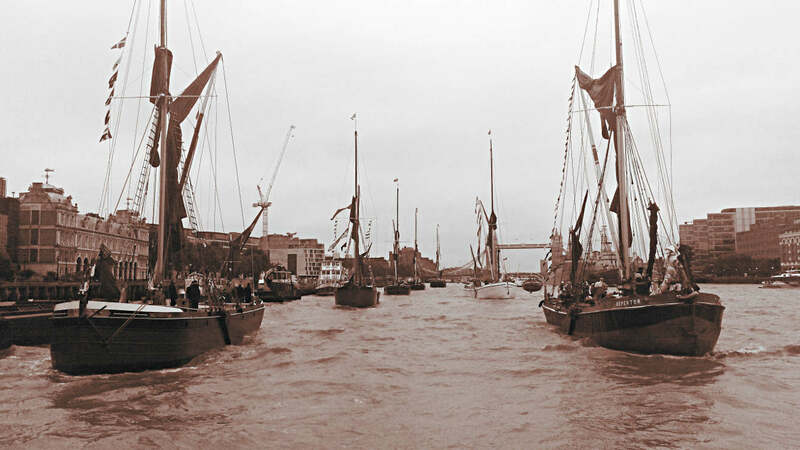 At that point, I knew we were onto something quite special and here with an established event known as The Thames Sailing Barge Parade. 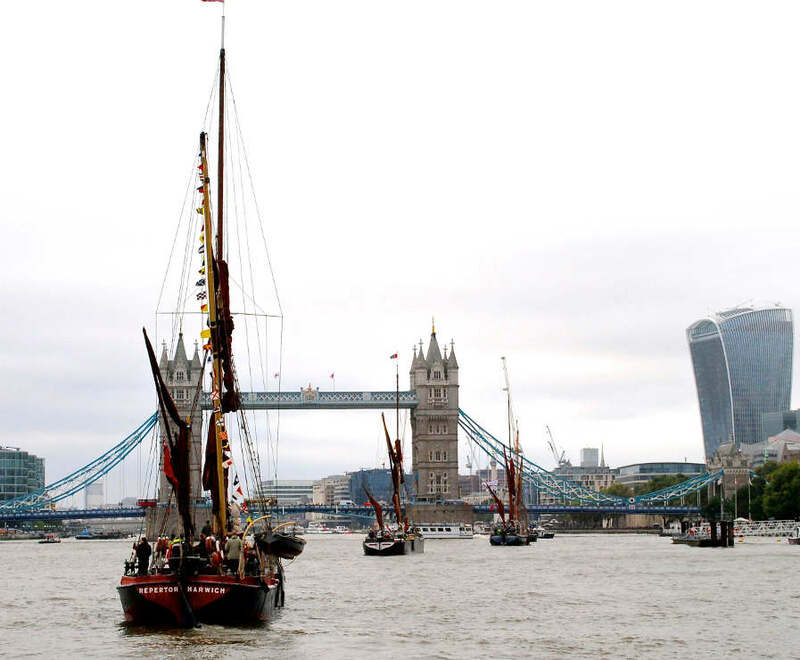 Barges will begin to arrive for the parade from Kent, Essex and Suffolk and will lock in to West India Dock at 09.30hrs and 16.00hrs. 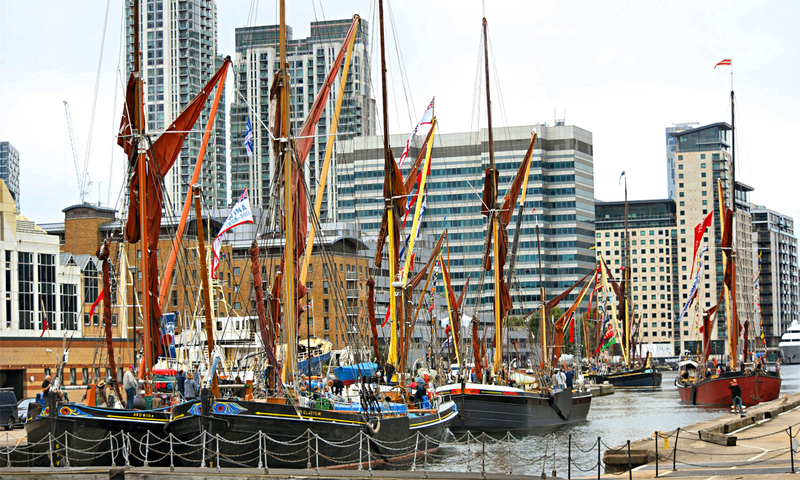 The barges will moor alongside Thames Quay and can be viewed from the quayside by the public. River Thames, City of London, Upper Pool. 09.30 Barges leave Thames Quay and head into the lock: up to 12 barges can fit in and once all securely moored up the lock gates will shut. 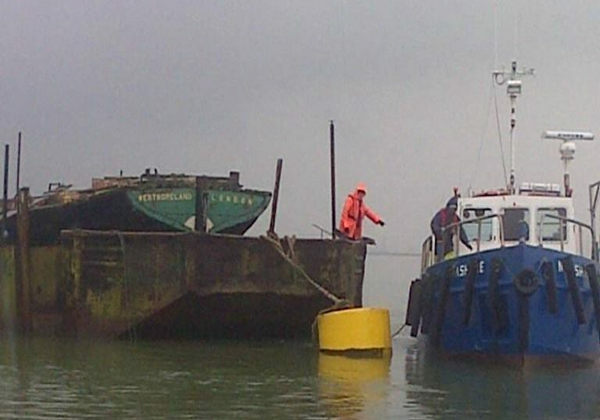 Edme will be towed by another barge as she has no engine. 10.30 Once the levels in the river and dock are the same the traffic is halted and the Blue Bridge is raised. 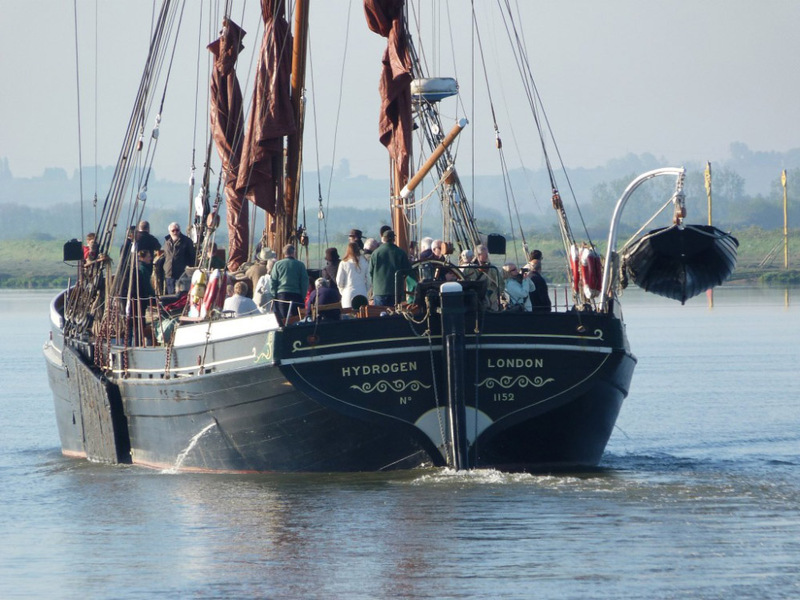 11.00 The barges will get into their order of parade, lead by Sailing Barge Gladys with Edme bringing up the rear being towed by Livett’s. This is the order, but it could change on the day: Gladys, Ardwina, Centaur, Victor, Reminder, Thalatta, Repertor, Melissa, Kitty, Niagra, Will, Edme. They then head up the river towards Tower Bridge. 12.00 Traffic is stopped and Tower Bridge begins to lift. 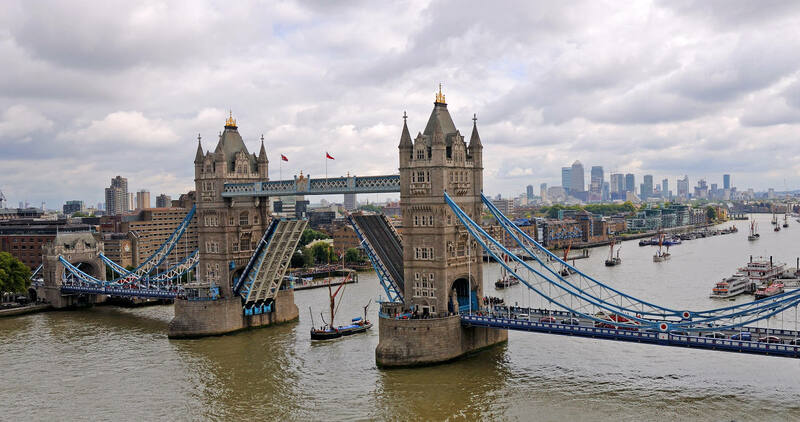 The largest fleet of barges will parade through the bridge and into the Pool of London in close formation, heading up towards London Bridge. Here they will wait, stemming the fast flowing ebb tide until Tower Bridge road has cleared of traffic and can re-open again. 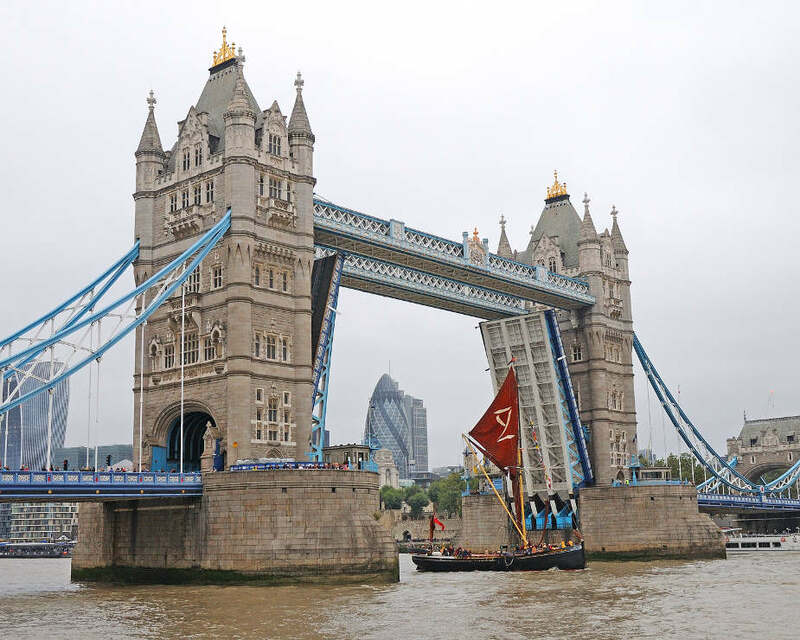 12.45 When conditions are ready, the first barge, SB Gladys will turn and lead the parade of barges back out of the Pool of London and through Tower Bridge. 2 small Livett’s launches will help the barges turn and the PLA Harbour Master will ensure all other river traffic keeps clear. 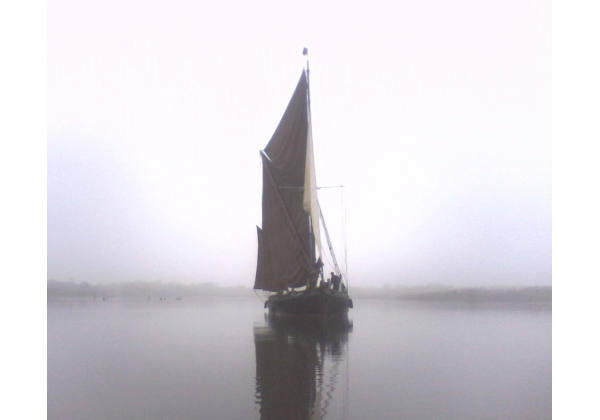 If conditions are suitable many of the barges will set some of their sails on the short journey outward bound. 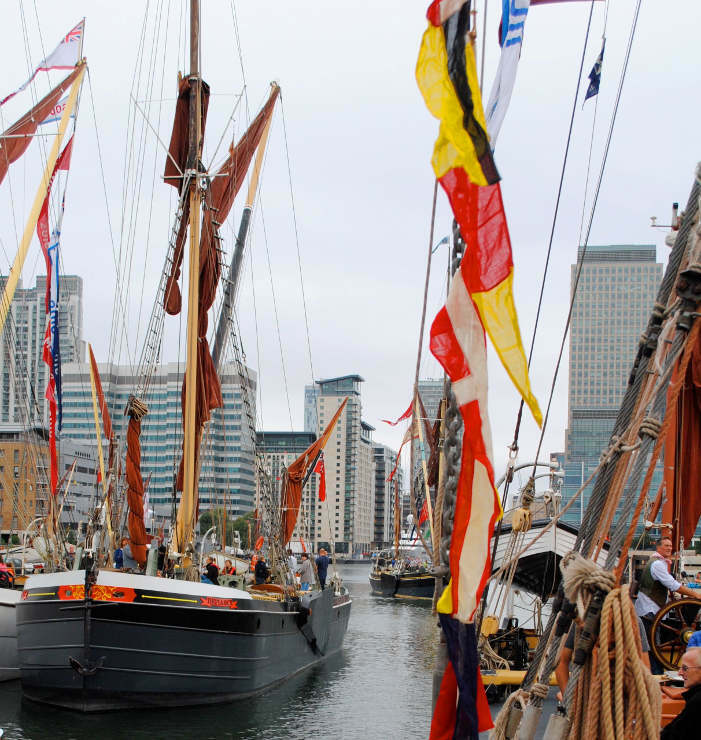 The fleet of barges will head down river and lock back into West India Dock at approx 13.45. 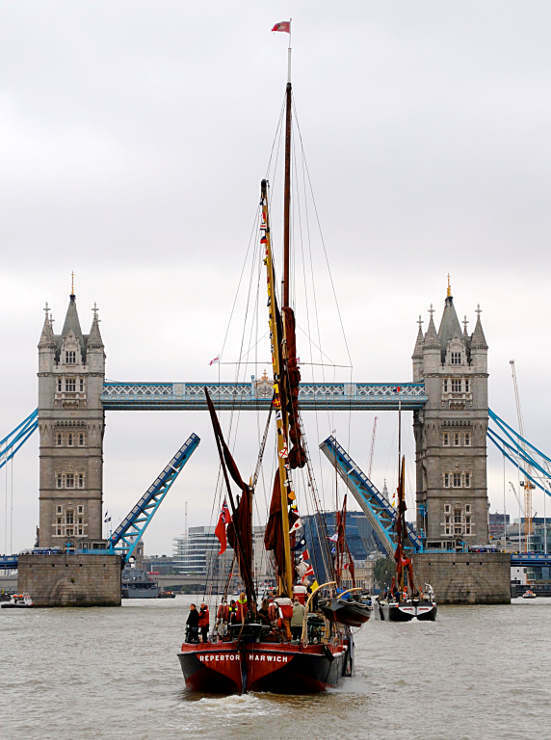 By 15.30 all barges will be moored back alongside Thames Quay and can be viewed from the quayside. 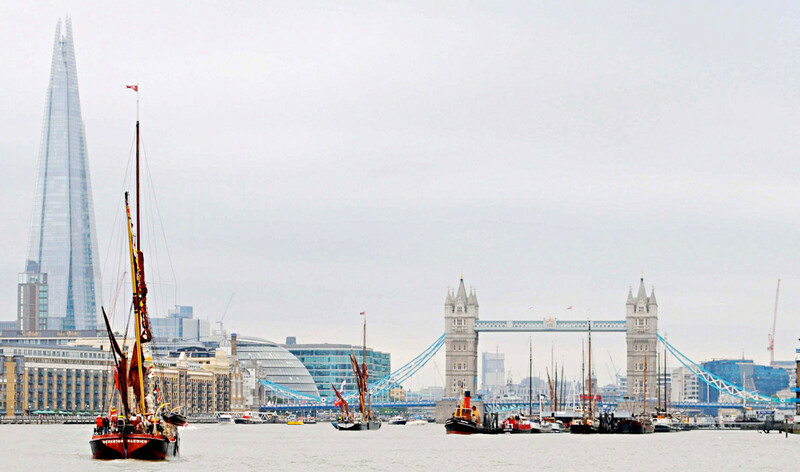 London Bridge (gives front view of barges - looking down onto the whole parade with Tower Bridge in the background). South Bank (port view of barges - left side). 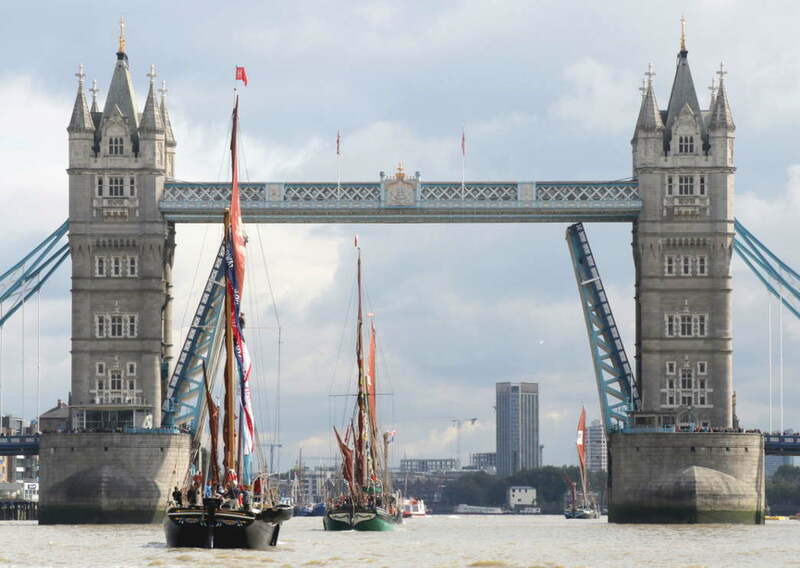 Tower Bridge gives rear view of barges with ability to see the whole parade stemming the tide at London Bridge. The barges are in the Upper Pool for some 30-40 minutes before they are turned by tug boats and head back out towards West India Dock. Best view of the tugs turning the barges is at London Bridge. Best vantage points for pictures when the barges are leaving are from the banks if you want Tower Bridge in your shots. South Bank (starboard view of barges - right side). North Bank (port view of barges - left side). Taking pictures from Tower Bridge as the barges leave will give you an overhead view of the barges down onto the decks. You will need a wide angle to get the whole barge in your shots. 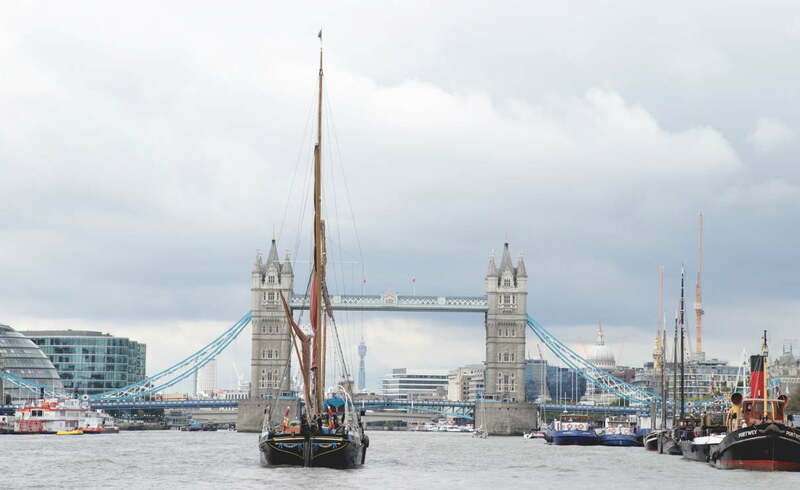 Fantastic opportunity to step onboard many of the Thames Sailing Barges which will be moored alongside the Thames Quay with easy access. 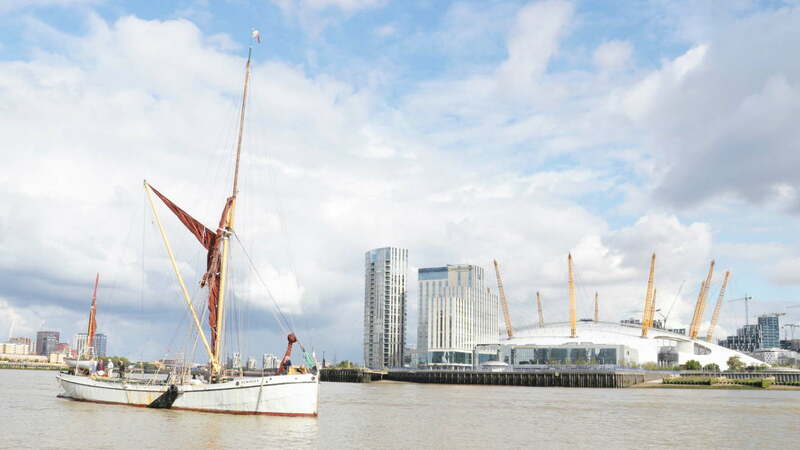 Learn about the importance of the Thames Sailing Barge and their history through the pop-up exhibition. See the cargos they used to carry through the authentic displays on the quayside. 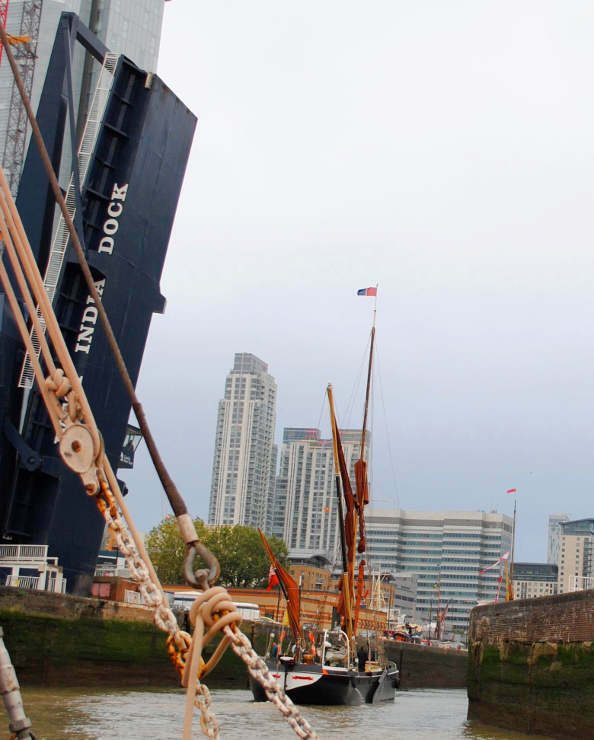 All the attractions at West India Docks (The Popup Museum) can be found at this link. This is now the fixed and confirmed schedule. 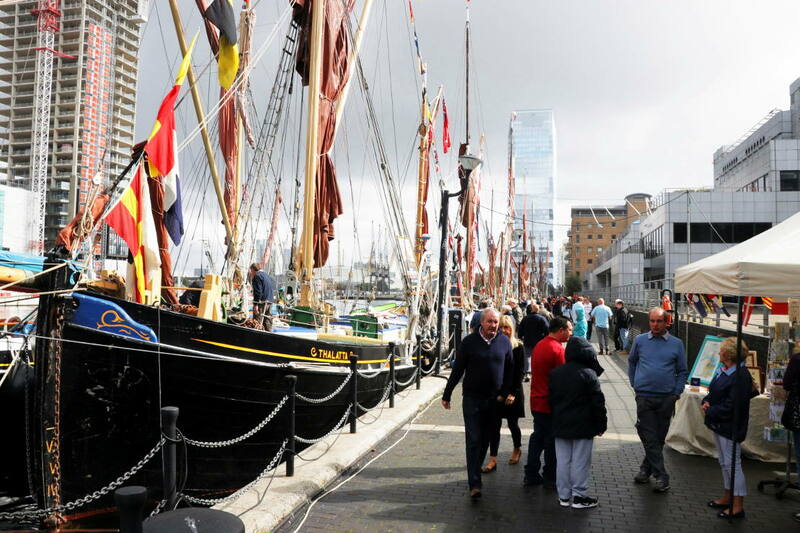 Here’s a little something about the attractions that will be at West India Dock compiled by Jane Harman. 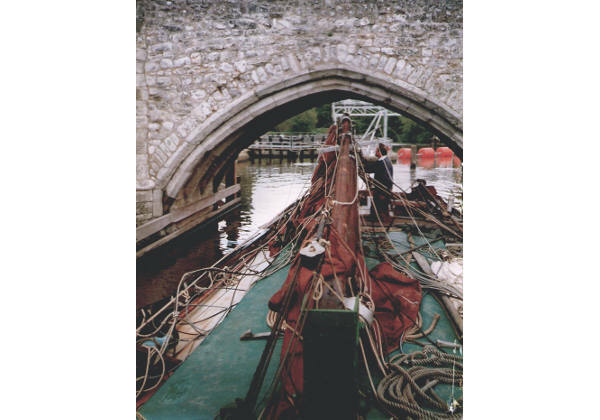 Chaffcutter Books, have an expanding range of maritime heritage nautical books planned to cover many aspects of seafaring, coastal and deep sea sail, steamships and fishing vessels; and those who crewed in them, specialising in Thames sailing barge history. Rachel Richards Ropework - items handcrafted from rope. Rachel will be demonstrating her skills; come and have a go! 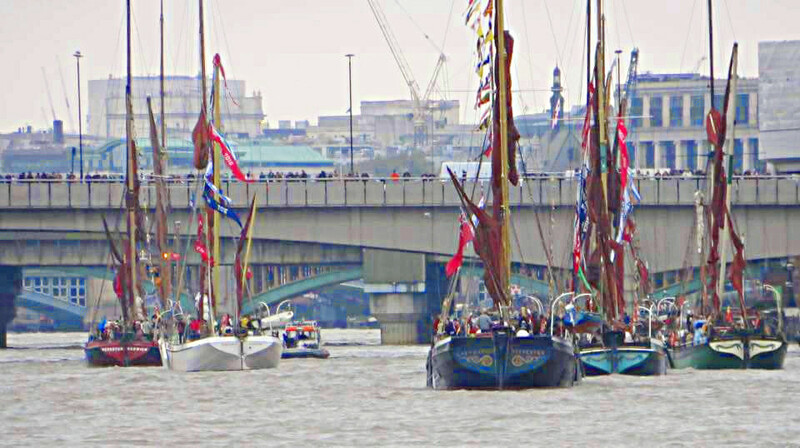 The event is associated with the Totally Thames Festival, celebrating the River Thames throughout the month of September. Every barge was built without an engine, the auxiliary power was introduced later in the 19th century. Every barge can be sailed by one skipper, his mate and their dog which they had along for security and protection. The first barge match took place in 1863 to challenge the competitive nature of the skippers who always wanted to get to the next load before their rivals. It was financed by a wealthy businessman known as the “Golden Dustman”, Henry Dodd. 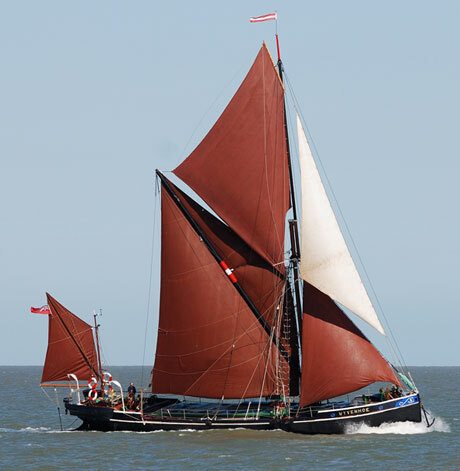 One of the sailing barge matches (there are eight), the Thames Sailing Barge Match, is considered to be the second oldest sailing race in the world. Being some 150 years old, only the America’s Cup is older. Many barges were requisitioned by the royal Navy during The First World War and many never returned. The same again happened in the Second World War, when many barges took part in “Operation Dynamo”, the 1940 evacuation of British and French forces from Dunkirk beaches on the north coast of France. 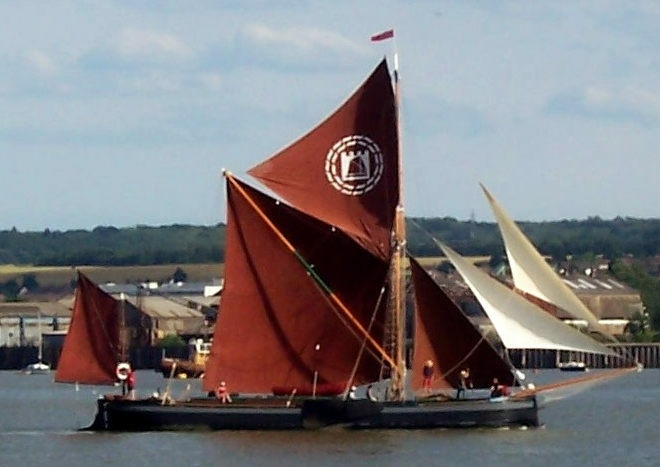 Thames Sailing Barges can float in as little as 1 meter of water (3 foot) fully laiden, which makes them ideal for maneuvering around the Thames Estuary. 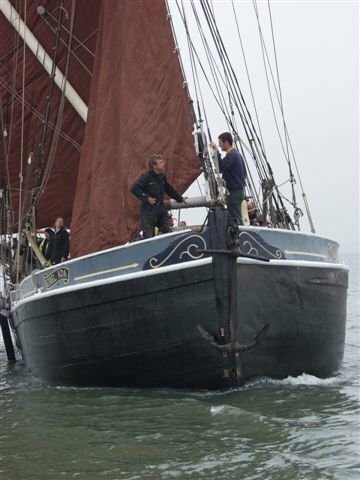 The bowsprit on some barges was only introduced because of the matches so that the barges could gain more speed through the extra large area of sail that could be set on it. 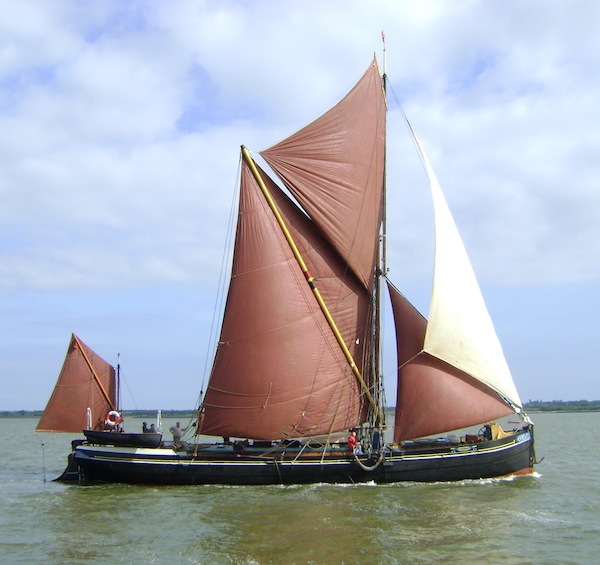 A little known fact is that a lot of Thames Sailing Barges are sitting at the bottom of the North Sea having been deliberately scuttled after the war because of the Great Depression 1929-1935/6. 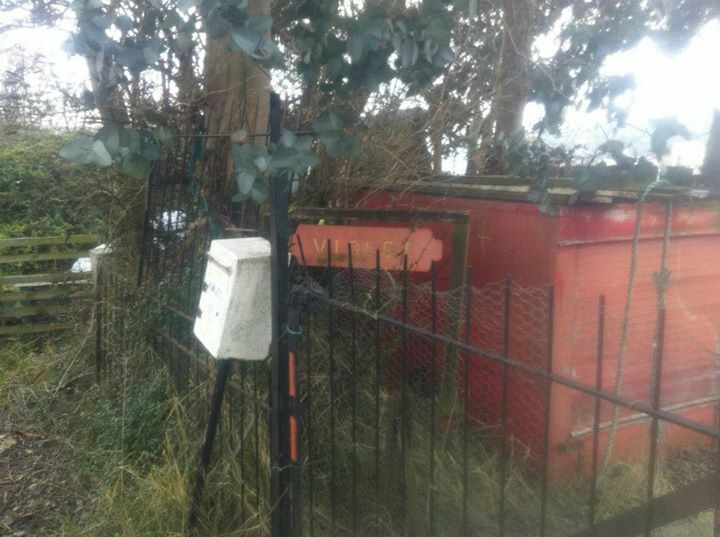 SB Kitty owner, Roger Marriott and Skipper Kevin Burtonshaw would be able to shed more light on this. 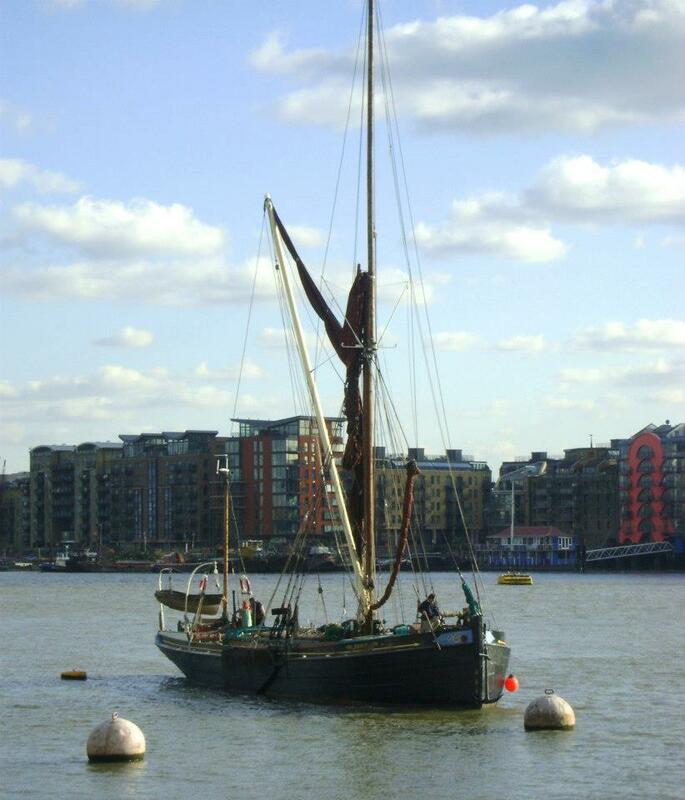 The last vessel to carry a cargo under sail alone in British waters was the Thames barge Cambria. She was also the last barge to carry a commercial cargo. Why will it be good for you to be updated anytime there is a development? Well, that is because the development process is like a juggernaut, it's big, it's heavy and it moves seemingly slow, but if it hit you, you'd know about it. No, in all seriousness, we encourage you to enter your details for notification updates, simply because they are far and few between, but when they do arrive, you will probably want to know about them and this will be the best way. Just fill in the simple form with your name and email, that's it. During the creation of this site we sought out most of the barge images through searches on the internet, we took the liberty of using these images without consent in the hope that the author would get in touch and make themselves known so that we could ask for permission. 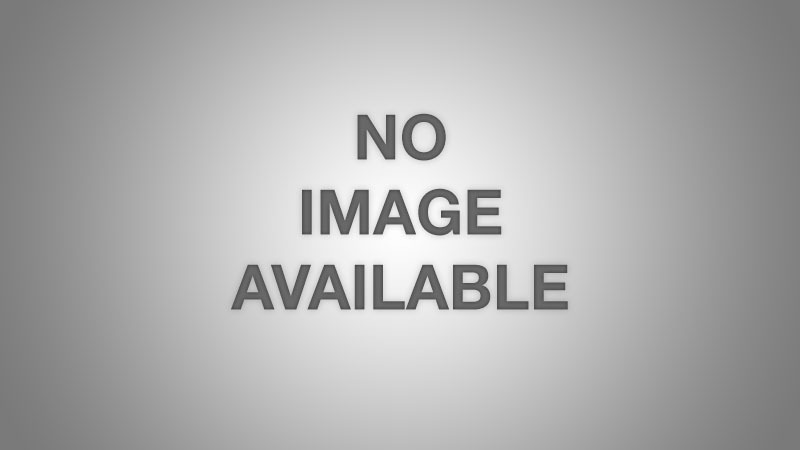 The images we used were mainly because we could not find anything to do with copyright, but we do know copyright in a photograph automatically belongs to its author, regardless. 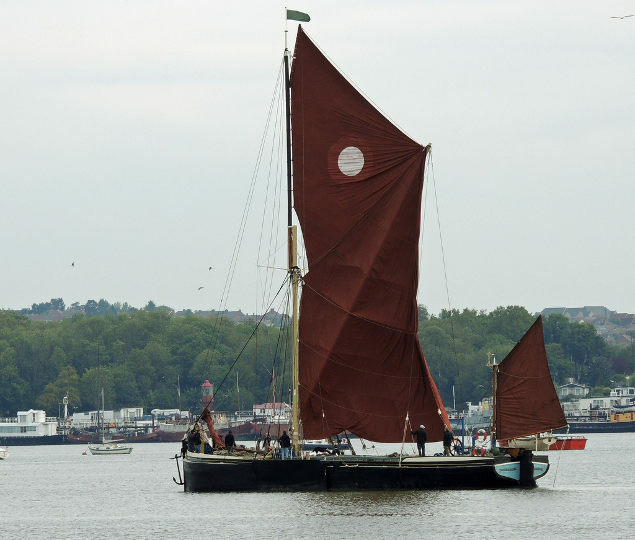 We did this calculating that the Thames Sailing Barge community is very small, but one where everyone knows everyone, and so we expect at some point to be made aware of the true authors of those images we are using without yet having full permission to do so. If you are an author of any image shown on this site please contact us and let us know if we can or can not use your image, and we are more than happy to give you, your moral right by tagging your name to your image as well as link to your own website if you have one. If not, and it is your request, then we will remove your image immediately and please accept our sincere apology for assuming that you would not have minded helping the Thames Sailing Barge community to thrive and survive by generating public awareness for its charitable cause. To those wishing to use images from this site, unless we have permission from the author to give you an image, we are terribly sorry, but we can not offer them to you for use in whatever nature that may be, as we have taken a chance to await the author's permission of use ourselves. If you recognise any image on this site as belonging to a person you know, please let them know we are using their picture and ask them to contact us so we can get their full permission of use or perform an immediate removal if that is the case. That's it, the 2017 parade and popup museum event is over now until 2019. The event will officially become biannual, as it takes a lot of time to organise with little recovery to get over the last before starting the next. Donations are welcome, the foundation is always in need of funding. Please donate what you can, if you can, but if you can't, encourage a friend or colleague to support the organisation and tell them why they should by pointing them here: WHY YOU SHOULD DONATE. Your brand will be seen by thousands on the bank-sides and millions through visual media such as television, print such as newspapers and magazines and digital media online. We can also mention our sponsor through audio media such as radio where agreed with the station. 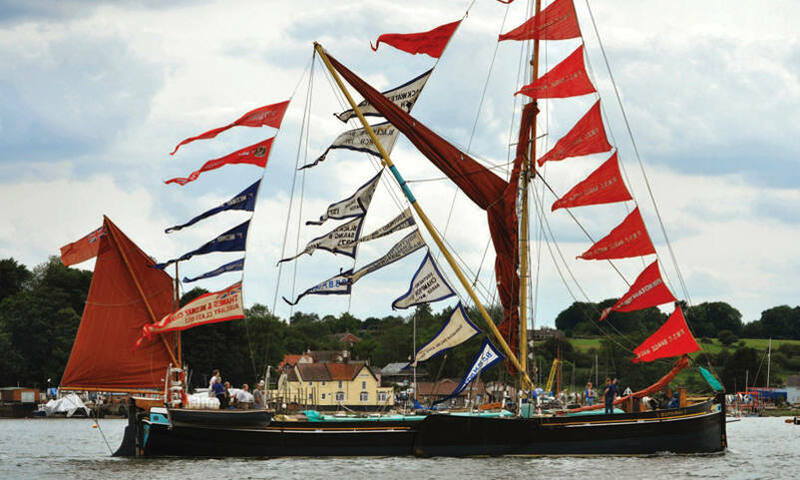 Our sponsor’s pennant or flag will stand out slightly from the other pennants and flags which will be those awarded to the barges for their wins and achievements at barge matches or for other special occasions and such like. Either way, we will be generating public awareness, directing them to our website and presenting footage of the event for years ahead. Any sponsorship pennants, flags, logos etc can be displayed within the marquee and surrounding areas as well as on the barges. It is up to the sponsor to supply their flags and/or pennants or arrange with TSBP organisers to get them made in time. Two weeks before the event is tightest deadline we can allow..
Sponsors will be allowed to setup as stall holders too after a discussion of pitch and placement. 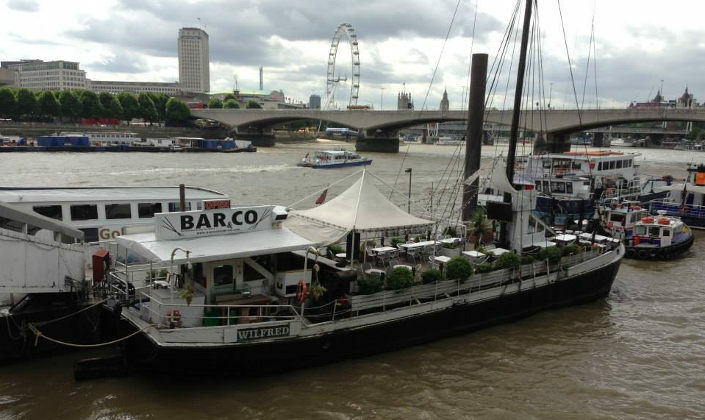 We can approach a particular barge owner if a sponsor would like to hold a static or corporate event on a barge, but this too will be a separate costing negotiated directly with the barge owner. We encourage a sponsor to tell their own audiences about the event and to come and enjoy a family day out. We implore you to get in involved, this is an event we don't want you to miss. 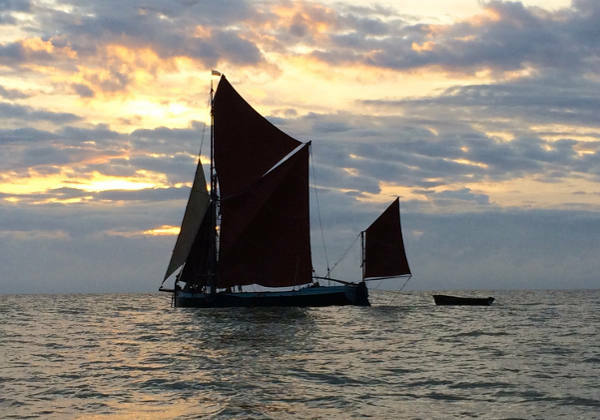 This film was produced for the first ever TSBP event in 2016, by Alan Cooper, who was introduced to the founder, Jonathan Fleming, by the then owner of Sailing Barge Kitty, Roger Marriott. It is a full length feature film (in internet terms), around 40 minutes, so set aside the time to watch it. Official No.161035. Tons: 79. Built steel at Mistley 1929 for M.F.Horlock & Co.Ltd. Latterly working in the ballast trade, she was converted 1990 for use as a restaurant / club. Now a private yacht owned by Iolo Brooks based in St.Katharines Yacht Haven. Official No.UNKNOWN. Tons: 57. Built of steel at Wivenhoe 1954 by J.W. Cook for Hubbocks as a swim headed lighter. Owned by Wrightson & Sons Ltd. Converted in 1997 by Owen Emerson and registered under S.S.R.No.68024. Sold 2002 to Sean Jacobs . Sold 2005 to Alan Gick(Alice 4 Charters). Based Portsmouth. Official No.108277. Tons: ?. built 1897 at Greenwich by J. Rennie for Harry Keep of London. 68 Reg Tons, Dims: 78.6 X 19.1 X 4.8ft. topsail barge of steel construction. 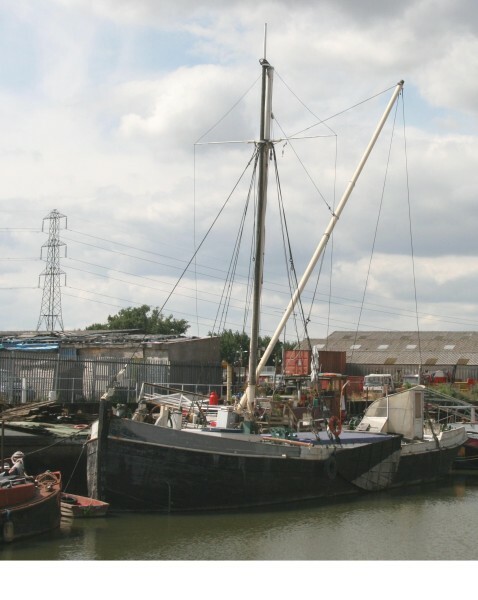 Sold by Keep to London and Rochester Barge Company. She was converted in 1907, using a Dann engine, to the first full power barge on the Thames and Medway. She was almost completely derigged except for a small mizzen sail to comply with the then current Board of Trade regulations. In 1913 the sails were removed and the Dann engine was replaced with an unknown 76 h.p. 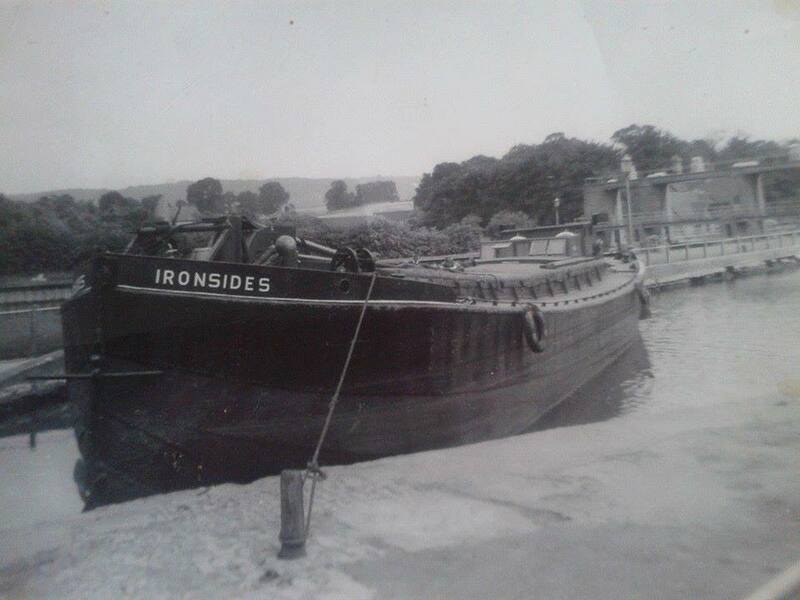 unit Worked as a motor barge from 1908 to 1963 before being converted to a house barge, moored at Allington. Moored at Fulham 1988 to 2001. Refurbished 2008/9 at Brentford & moved to Bembridge I.O.W. The image we had here until April 30th 2016 was mistakenly of Resourceful. We are trying to source a true image of Arctic. 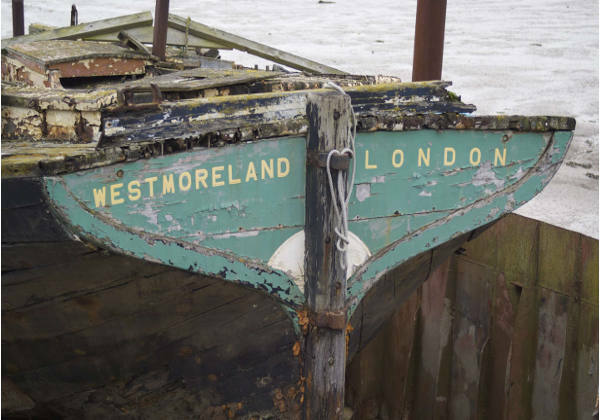 This was pointed out by the Chairman of The Society for Sailing Barge Research (S.S.B.R), Richard Walsh. S.S.B.R. 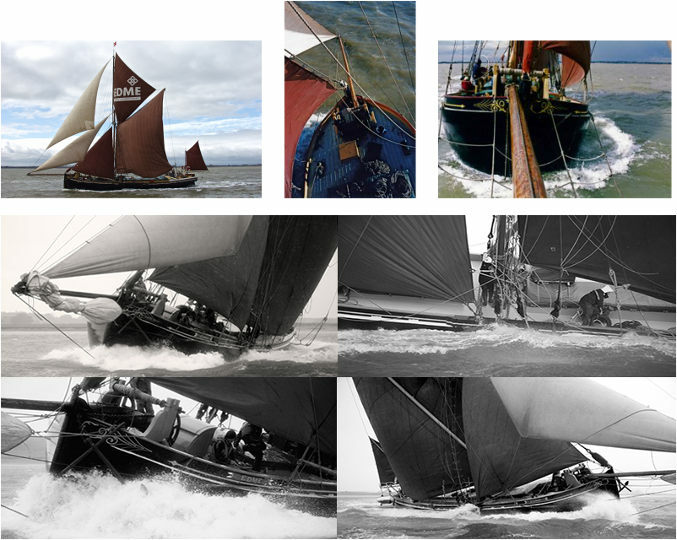 have been researching, preserving and sharing sailing barge heritage for over 50 years. 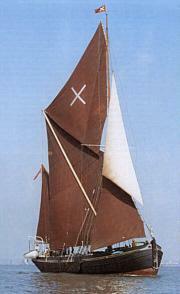 ARDWINA of London, STAYSAIL Class ('Bob' has - Red 'A' & Navigational dividers on 3 blue horizontal bands on white ground). Has "Rolfe Judd"in topsail. Official No.129016. Tons: 66. Built of wood at Ipswich in 1909 by W.H. Orvis. 85. x 21.1 x 6.4, for E.J. & W.Goldsmith of Grays, Other owners: sold 1938 to Metcalf Ltd. London. 1941 Ocean Salvage, Gravesend. 1942 T.J.Metcalf , Gravesend. 1950 Daniels Bros & L. Vandersyde of Whitstable. 1950 Daniels Bros & M. Blyth. 1959 as a yacht Brian Herve. 1961 G.Newman of Maldon. 1966 J.Hunt & R. Hogben. 1971 J. Hunt. early 70's Porter. c'1980 Rolfe Judd Practice (Ardwina Ltd.) Rebuilt 1982. Last barge built at Ipswich. Based St.Katharines Yacht Haven. Official No.110037. Tons: 63. Built of steel by Forrestt of Wivenhoe in 1898 84.4 x 18.6 x 6, rebuilt 1945 by Pollocks. Owned by Hughes and L.R.B.C. Converted to motorbarge and sold out of trade, Owned since 1985 by Rupert Ashmore based Battersea. Official No.105421. Tons: 63. Built of wood at Harwich in 1896 by Cann. Owners, Cranfield Brothers Ltd ended working life as motorbarge between Tilbury Grain Terminal and Rochford Mills in 1977, Bought 1978 by Stan Cresswell and Roy Woods and rerigged at Ipswich. Used by Steven Young for receptions in Millwall Dock sold 1999 and moved to Newcastle. Returned to Maldon 2003 owned by Ray & Ben Payne. Based St.Katharines Yacht Haven. For Sale 2010. Official No.SSR No 87565. Tons: ?. Ex Maartelaasgracht built of steel by Gideon of Groningen, Holland in 1924 as motor sailing bulk cement carrier. Counter stern replaced 1997 by owner skipper Eddie Smith, now 77’5”x17’8” based Pin Mill. For Sale 2010. CABBY of Rochester, BOWSPRIT Class ('Bob' - plain white C on plain red ground. ) Dark grey lower hull with black wale. Recently sold 2017, sale details unknown. Official No.120676. Tons: 79. Built of wood at Greenhithe by Wm. Eberhardt in 1906 Had wheelhouse & was mulie rigged. 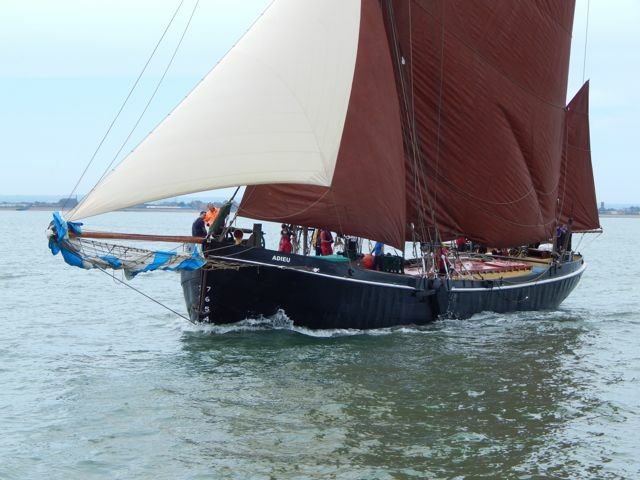 Last sailing barge trading under sail. Owned by Cambria Trust from 1996. 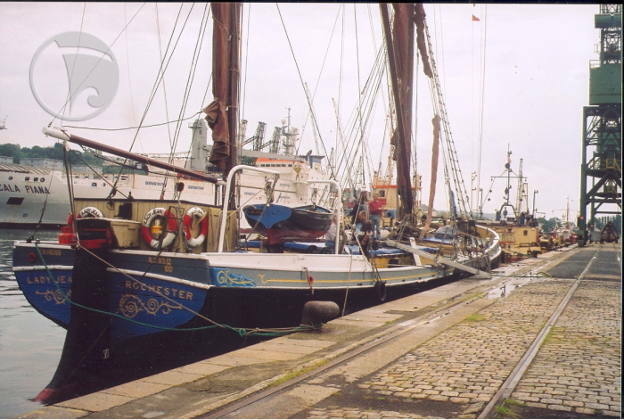 Moved from Dolphin Yard Museum , Sittingbourne to Sheerness Docks in lighter 2006. 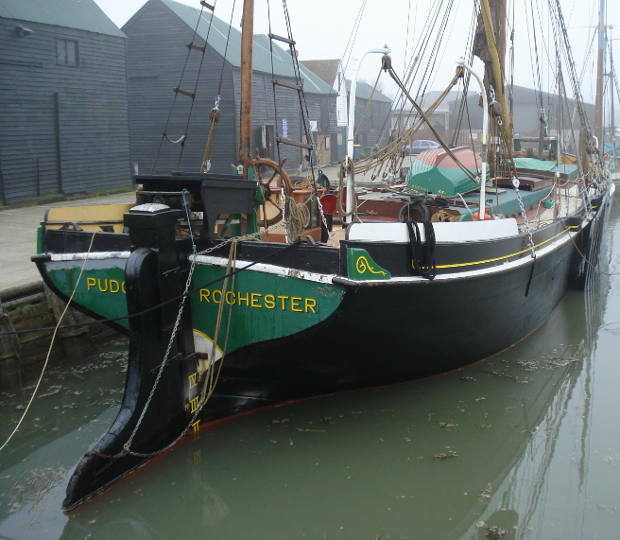 Moved to Faversham for restoration 2007.Completed 2011. Official No.118314. Tons: ?. Built 1903 at Papendrecht, Holland by J.Kievets & Van Reede for E.J. 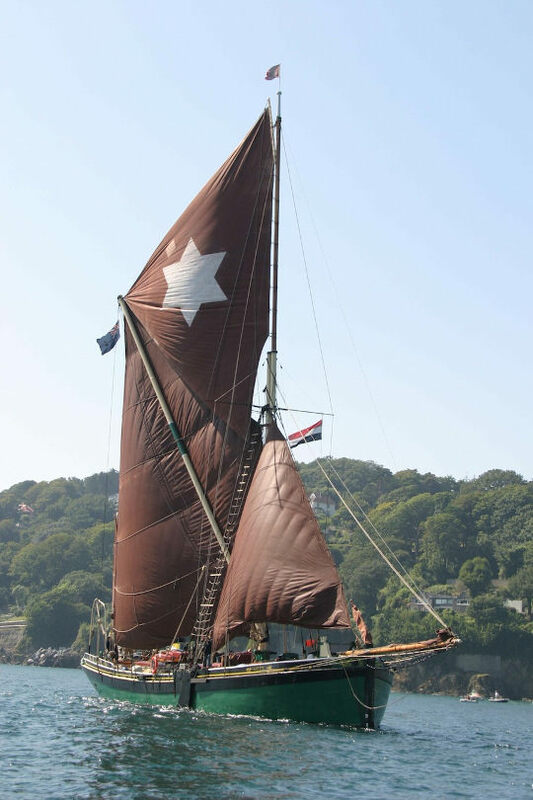 & W Goldsmith of Grays, 120 Reg Tons, Dims: 90.0 X 23.2 X 9.0 ft. Steel Connstruction, spritsail rigged, Other owners include Ministry of Transport (1941), Vectis Shipping, Archie Sheaf of Newport I.O.W. and L. George. Motor barge conversion 1941. Last used as a workshop at Dolphin Yard Museum, still there 2010 almost derelict. Official No.99460. Tons: 61. Built of wood at Harwich in 1895 by Cann, 85.6 x 19.5 x 6.2. Owners, Charles Stone, c.1900 Dolly Rogers, 1911 Ted Hibbs, 1915 John Sawyer, then Francis & Gilders and L.R.T.C. In 1955 she was derigged by Brown & Co. for use as a timber lighter. 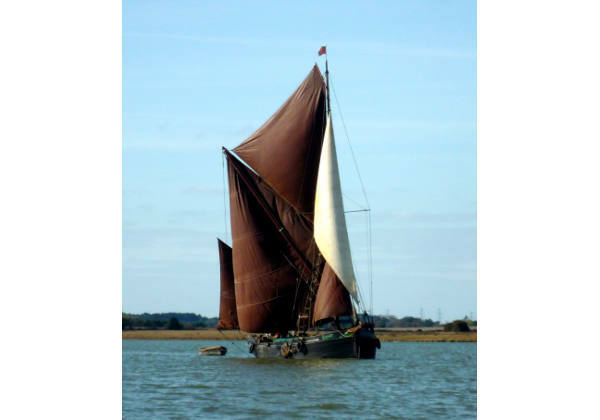 Bought in 1966 by Richard Duke to rerig as a charterbarge she was sold in 1974 to the Thames Barge S.C. for members sailing. 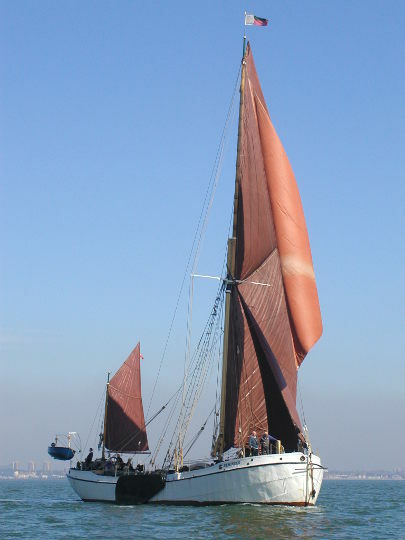 Rebuilt 1984-95, Owner now Thames Sailing Barge Trust. Based at Maldon. Official No.84028. Tons: 16. Very small working barge built with a single hold at Frindsbury of wood in 1881 by Curel and owned by Walter Wrinch of Ewarton. Later owners Payne, and Mica Brown who refitted her as a private yacht . Reverted to tiller steering and had mizzen stepped on rudder post from 2005 under Mica Brown and Des Kaliszewski. Based at Snape Maltings. Official No.105902. Tons: 54. Built of wood at Maldon by Cook. 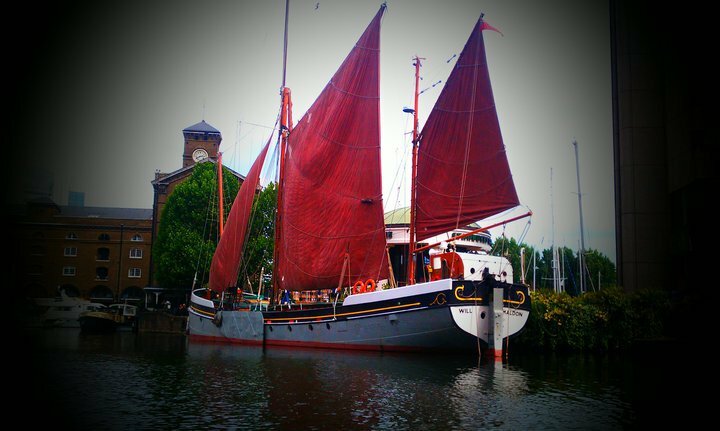 Owned DAWN Sailing Barge Trust.. Moved from Hoo to Maldon 1999. 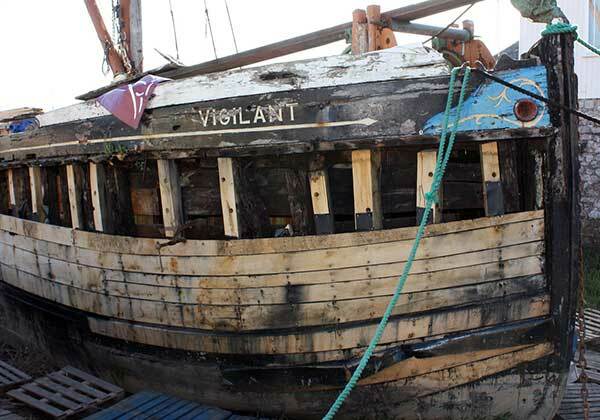 To Heybridge 2002 for restoration (aided by lottery grant). 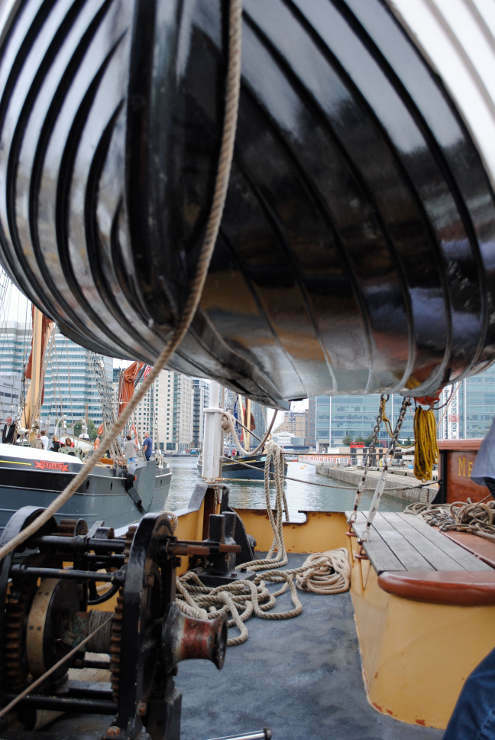 Hull re-launched 2007 - rerigging completed 2008. moved to Pin Mill 2009. Official No.116180. Tons: 64. Built of wood at Harwich in 1906 by Cann. Owned by G.F.Sully she traded until 1961 as motorbarge. Rerigged by Vernon Harvey she had many successful races. Moved to Liverpool Docks, she returned to the East Coast 1990 and is now based Halstow owned by Geoff Gransden. Undergoing restoration 2005. Active 2010. Official No.96483. Tons: 45. Built of wood at Maldon in 1889 by Howard. Owners, John Parker of Bradwell. 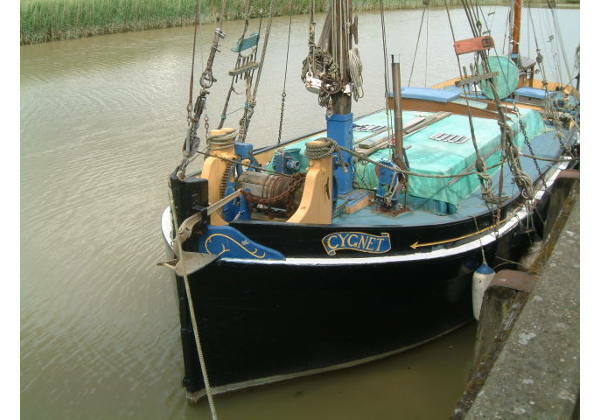 Sold c.1910 to James Keeble; used as a motorbarge by Green Brothers '51 Lost topmast 1959 but carried fore and mains'l until 1963 when laid up. Rerigged as a residential yacht by B.Metherill at Hoo. 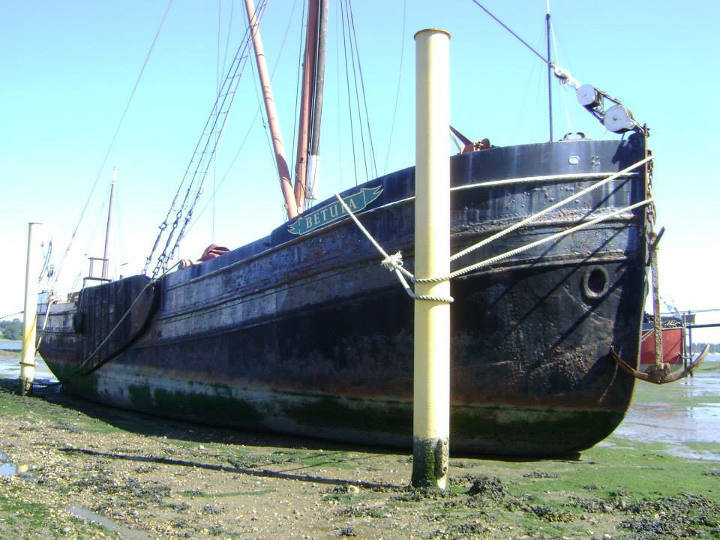 latterly owned by David Maude, Michael McInnerley,moved to Dolphin Yard, 1997, 2001 sold for restoration to Garry Diddams, 2004 at Shoregate on the Medway. Continuing 2010. Official No.97686. Tons: 68. Built of wood at Harwich in 1893 by Cann 82.3 x 19.8 x 6.8. Owned by Robert Smith, sold 1930 to Cranfield Bros. Became a motorbarge in 1954 in ownership of Lapthorn & Co. of Hoo. Sold out of trade in 1972 and rerigged by Patrick Law. Owned from1976 by Sarah Roberts, then Kevin Symonds at St.Katharines and sold 1998 to Robert Deards. At Hoo for refitting 2004. Moved to Hoo Saltings 2008. Official No.SSR No 65378. Tons: 65. 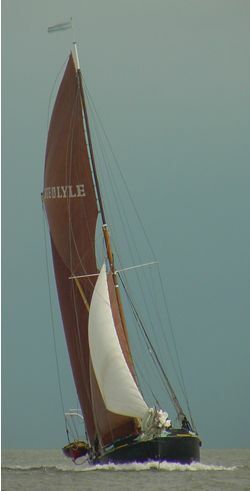 Built 1936 as a steel swim headed lighter. 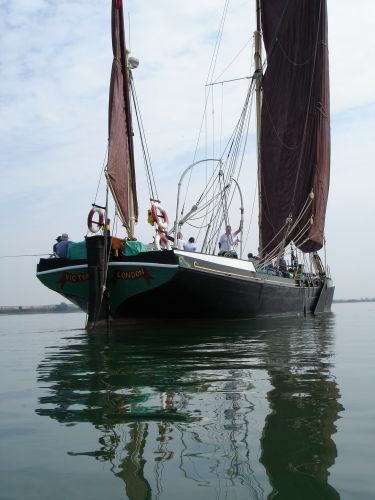 Converted to a swim headed stumpy rigged spritsailed barge by owner Steve Brotherhood 1996. Based Colchester, Hythe. Official No.84430. Tons: 59. Built of wood at Murston in 1882 by Smeed Dean & Co.Ltd for their own use passing to A.P.C.M., Francis & Gilders and Browns for lighterage. Rebuilt 1922 at 64 ton, later housebarge at Heybridge. 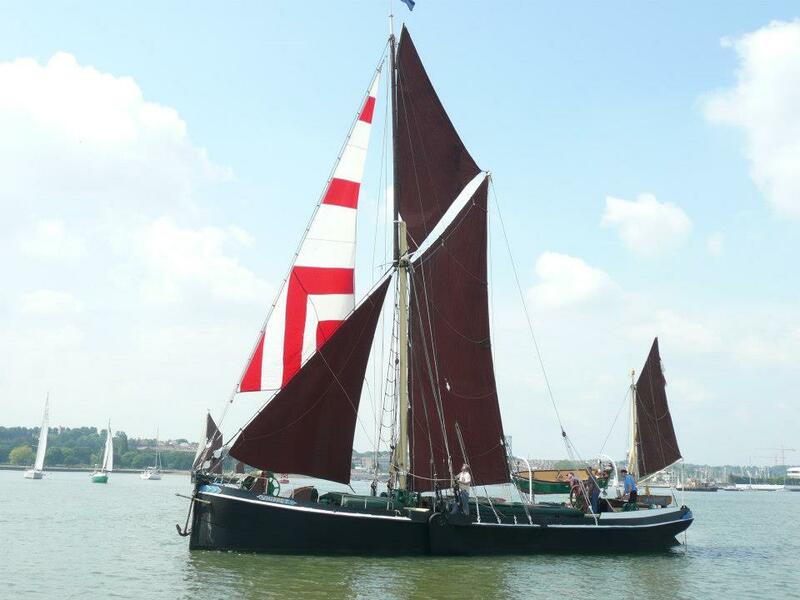 rebuilt Maldon and awaiting rerigging by owner Ken Greenhalgh. Continuing 2009. Official No.127260. Tons: 82. Built of wood at Rochester in 1913 by Little. Owned by John Wilks of Deal, later Samuel West,. Crossley engine installed in 1975. Houseboat at Otterham, rerigged at Ipswich by Steve Barry but abandoned at Maldon, Recovered by G.Reeve and sold to Hugh Poore 1988 who undertook her rebuilding at Dolphin Yard, Sittingbourne. Sold to Topsail Charters of Maldon 2002 . Barge hull sold 2007 to David Fennell for complete rebuild. Continuing 2010 at Maylandsea. Official No.118381. Tons: 44. Built of wood at Goldsmiths yard Grays in 1904 by A.White. 76.3 x 18.1 x 5.1, and owned by Cole and Lecquire Ltd. Rebuilt by Wills & Packham 1944 and Bought out of trade in 1948 by Arthur Bennett. Derigged as housebarge at Twinney, later refitted at Sittiingbourne by Steve Downer and sold 1998 to Justin Ford . Major refit 2003. Based Faversham . Official No.112710. Tons: 78. Built of dutch iron at West Thurrock in 1900 by Clarke & Stanfield 85 x 20.3 x 6.4. Owned by A.P.C.M. and sold to L.R.T.C. in 1928 she was converted as motorbarge in 1938 and traded to northern France. 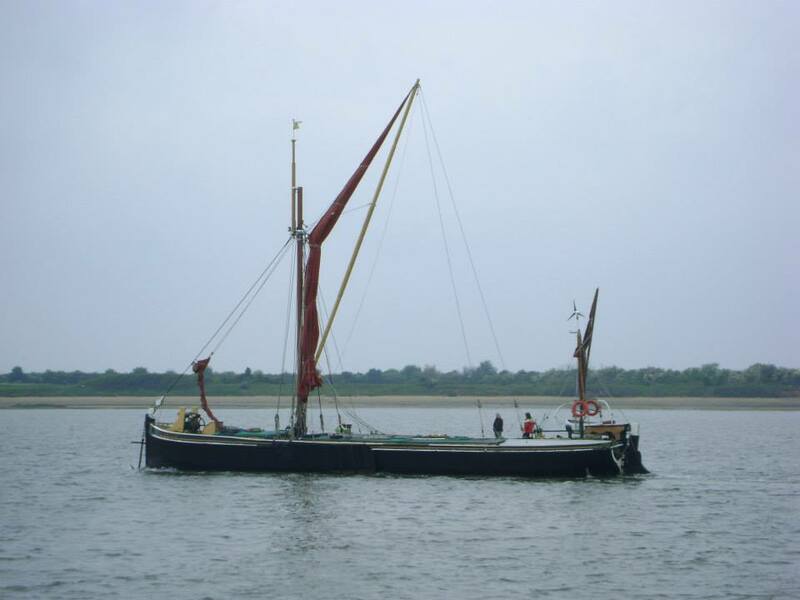 Sold to Alan Reekie 1968 to rerig at Brentford she became a successful racing and charterbarge. Now owned by Mark Tower, based at Maldon / St Katherines. 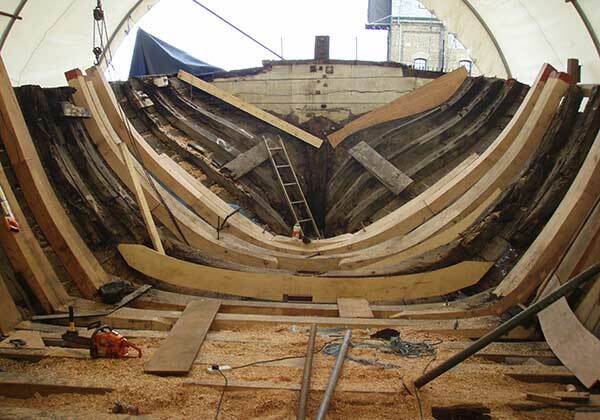 undergoing refit at Standard Quay Faversham from 2003. Official No.105418. Tons: 65. Built of wood at Harwich in 1895 by Cann. Owned by Horatio F.Horlock, sold in 1933 to Francis & Gilders and passed to L.R.T.C. 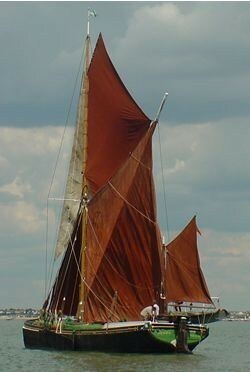 then used as timber lighter by Brown & Co before being sold to Maldon Yacht & Barge Charter Co. Ltd to be rerigged in 1964. With a six pointed white star in her topsail under John Fairbrother became notable racer. Owned by Roger Marriott . Based Maldon. Sold by the Elisabeth and Michael Manelli to Sam and Andy Howe. Official No.148366. Tons: 86. Built of wood at Rochester in 1923 by Short Bros.91.2 x 21.6 x 7.5. Aux. Ruston 100 installed 1948 but removed 1958 by R. & W.Paul Ltd. 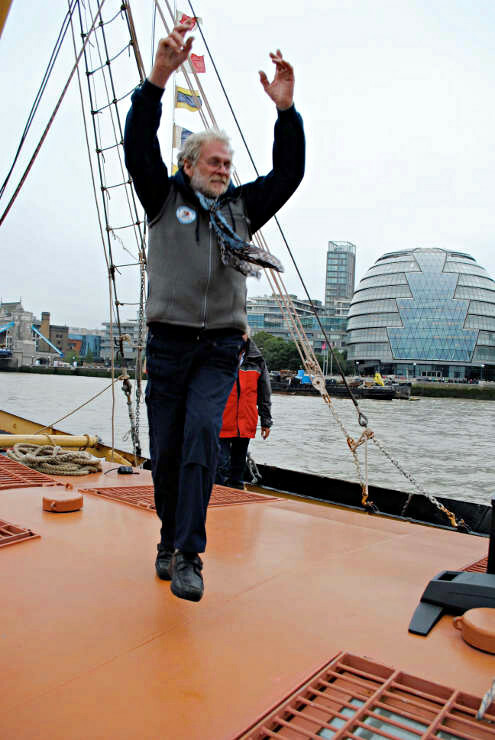 Renamed Sir Alan Herbert by East Coast Sail Trust for youth sail training. Bought by Iden & Sheena Wickings for a barge yacht and reverted to her original name. Owned Steve Morrison from 2008. Staysail Mulie with half wheelhouse. Based at Maldon. Official No.113753. Tons: 56. Built of wood at Ipswich in 1902 by Orvis, 84 x 19.3 x 6.2 for R. & W. Paul Ltd. 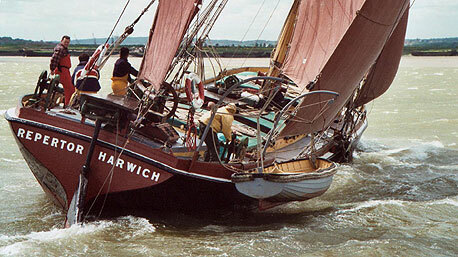 Owned 1961 by A.J.O'Shea as charterbarge later by Albert Groom. 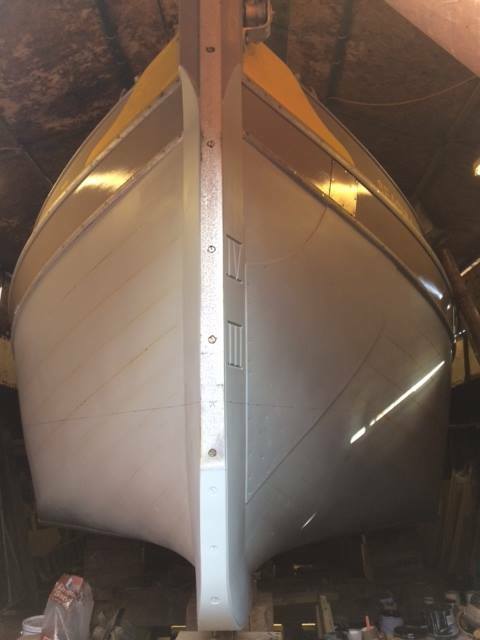 Dark grey hull with varnished transom and owned by Simon Devonshire. Changed to Staysail 2010. Changed to Bowsprit class 2011. Based at Hoo overwinters at St Katherines. Official No.110078. Tons: 67. Built of steel by J.G. Fay at Southampton 1899 for E.J. & W.Goldsmith of Grays. Acquired by L.R.T.C. converted to motor barge 1944. House Barge 1975. Owned by Jonathan & Richard Webb. Under restoration 2000 - 2008. Sailing again 13th July 2009 and competed in, and won her class in the Pin Mill Sailing Clubs 48th Annual Barge Match and gained a creditable 2nd behind Edme in the same years Colne Match. Official No.96488. Tons: 49. Built as the Ready at Maldon in 1892 by John Howard. owned by Charles Gutteridge of Vauxhall later W.W.Keeble. Name changed in 1947. 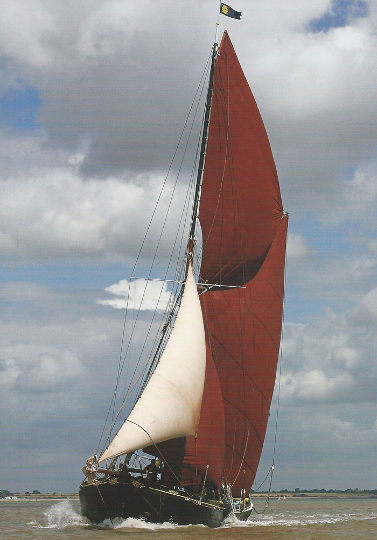 Owned by Francis & Gilders, used as timber lighter at Heybridge, sold to Claude Deval who organised her rerigging in 1965, Owned by Peter Dodds. 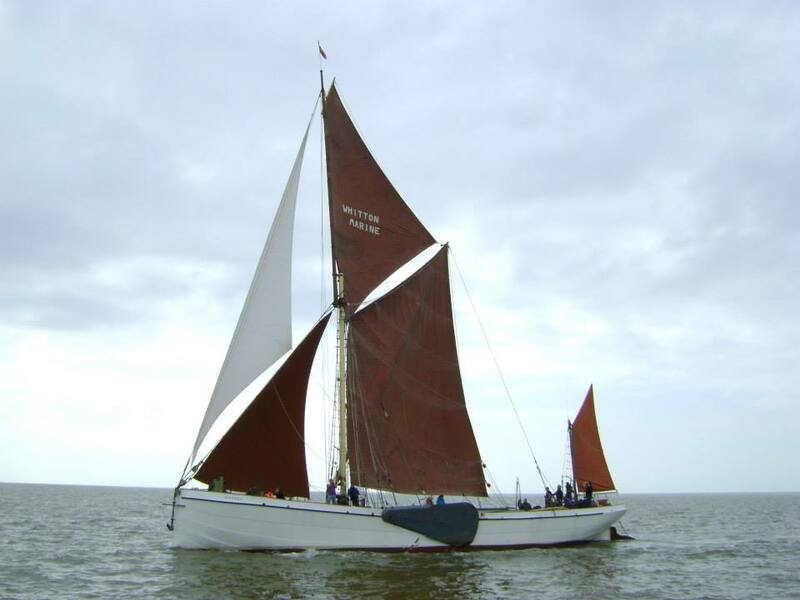 She was sponsored by Blue Circle becoming one of the most successful racing barges of recent years. Still has no motor. Based at the Iron Wharf, Faversham. She had her 125th Birthday (2017) and celebrated 40 years ownership by Pete and Sally Dodds. Official No.114452. Tons: 43. Built of wood at Faversham by Cremer in 1901. Owned by Daniels 1950, later by Lapthorn, Motorbarge from 1952. 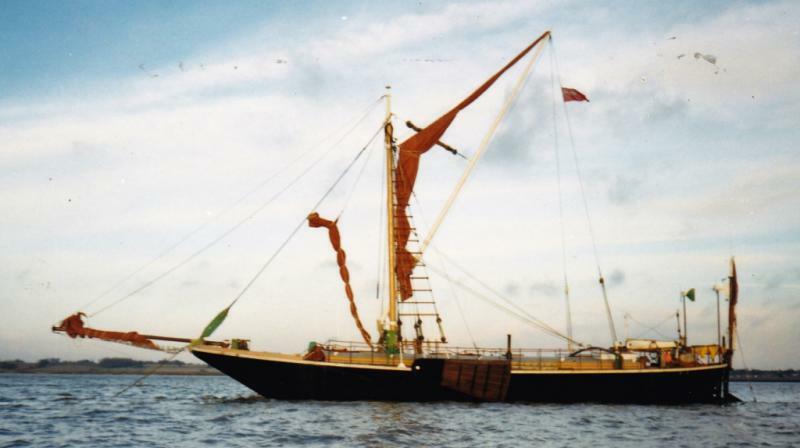 Rebuilt Twickenham 1985 and completed Cooks, Maldon 1994, stumpy rigged, 1996. Owner Prof. Diane Montgomery. Stumpy rigged. Based Maldon. Official No.108373. Tons: 79. Built by Forrestt at Wivenhoe in 1898. 86.7 X 20.6 X 6.7. MB 1924 LRTC. Restoration project at Battersea 1970. 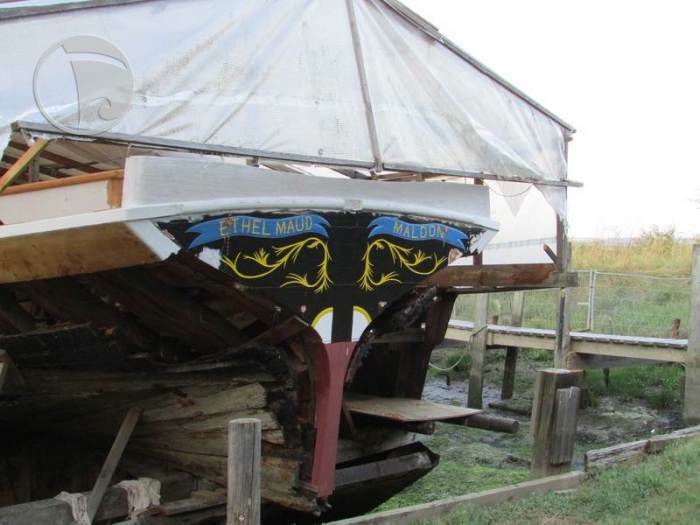 Sold to Deptford Community Centre and 2001 to Peter Sands, moved to Hoo for restoration. Continuing 2010. Official No.104862. Tons: 70. Built of wood at East Greenwich in 1895 by Hughes and owned by Mason, later Cranfield Bros. Aux Ruston 80 fitted. Sold to L.Tester and rerigged at Hollowshore '70's. Stranded ashore she was refitted 1990 as a private yacht. Owner Geoffrey Ingle. Restored 2004. Based at Faversham. Official No.146700. Tons: 81. Built of wood at Sittingbourne 1922 by Wills & Packham. Owners include E.A.Horlock, and R.Sully converted to a motor barge in 1949 she traded until 1973 when she was sold out of trade to Albert Groom for chartering & community purposes based at Ipswich. 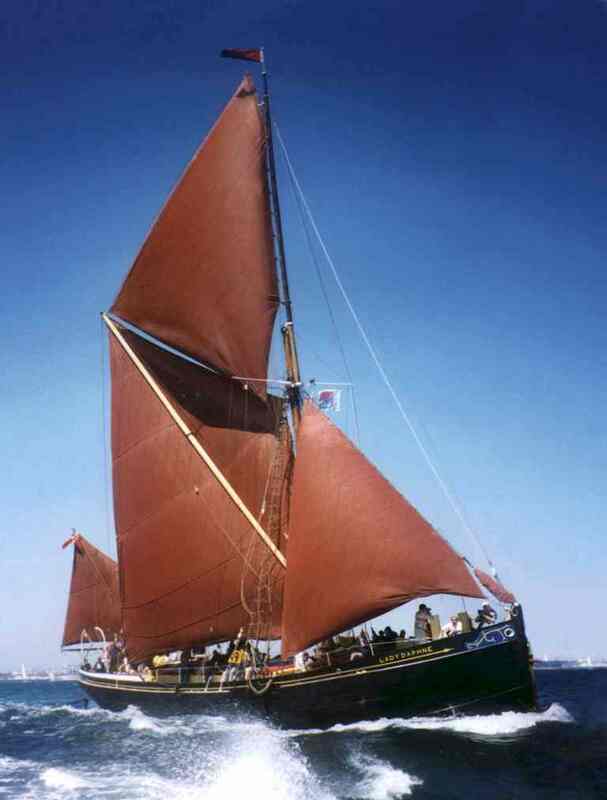 Moved to West India Docks then to Pin Mill and Maldon for restoration under sail 1998, owner Grant Littler. Based St. Katharines. Official No.145405. Tons: 68. Built of steel at Mistley in 1925 by Horlock. 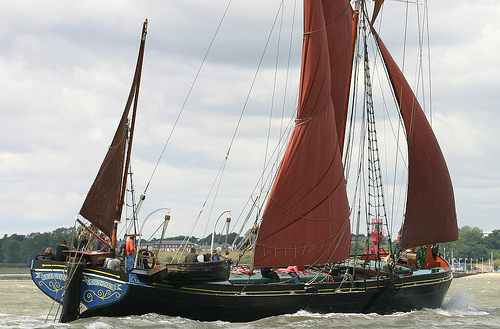 Converted to motorbarge by Greenhithe Lighterage but rerigged by Lawrie Tester as bowsprit barge based at Hollowshore near Faversham, sold end 2001 to Landbreach Ltd of Maldon for major refit. Continuing 2009. In 2017 she was laying at Heybridge Creek. Not rigged. Official No.127274. Tons: 67. Built of wood at Frindsbury 1922 by London & Rochester 82.4 x 21 x 6.8 (overall 84 x 24) as a bowsprit barge. Auxilliary 2 cylinder Kelvin petrol parafin engine installed 1931 replaced by 3 cylinder Bargus Co. (Kelvin) engine 1935. 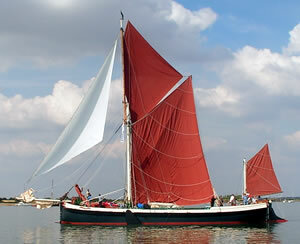 Bought out of trade as a twin hatched motor barge by Thames Barge Sailing Club and rerigged 1968 for members sailing. Engine replaced by Bedford 8.2 litre diesel 1991. Major refit 2004/7. 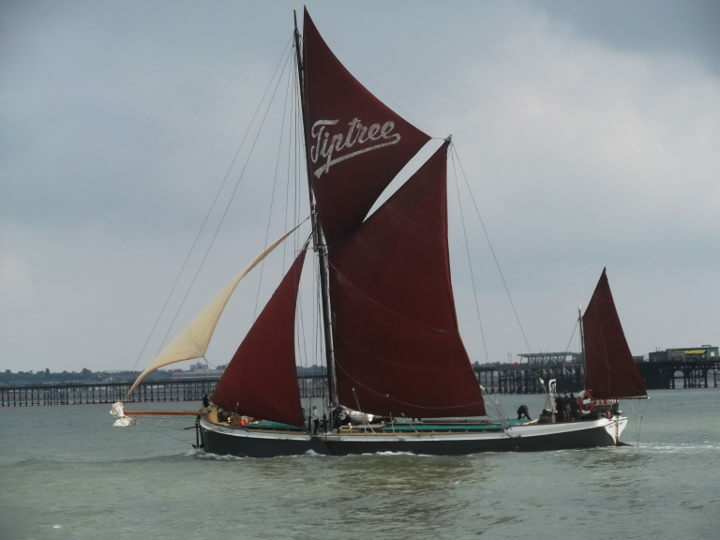 Owner now Thames Sailing Barge Trust. Based Maldon. From 2017, extensive refurbishment over the past few years - regularly sails. Official No.145058. Tons: 80. Built of wood at Sittingbourne 1920 by Wills & Packham for G.F.Sully. Aux Kelvin 88 engine installed 1939. Sold out of trade, rerigged at Pin Mill. Owned Ian Houston. Charter barge with Topsail Events & Charters 2008. 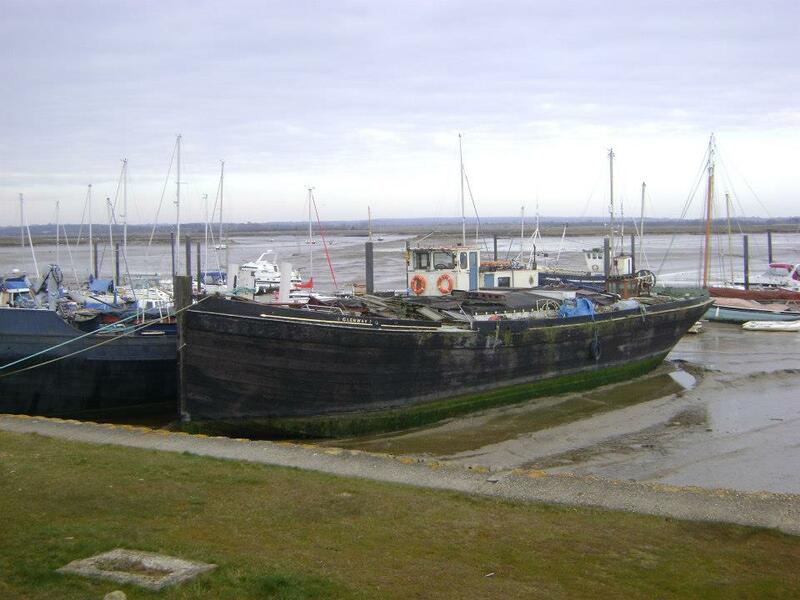 Laying at Heybridge Basin Winter 2012-13. Official No.161033. Tons: 79. Built of steel at Mistley in 1929 by Horlock and owned by Fred Horlock. 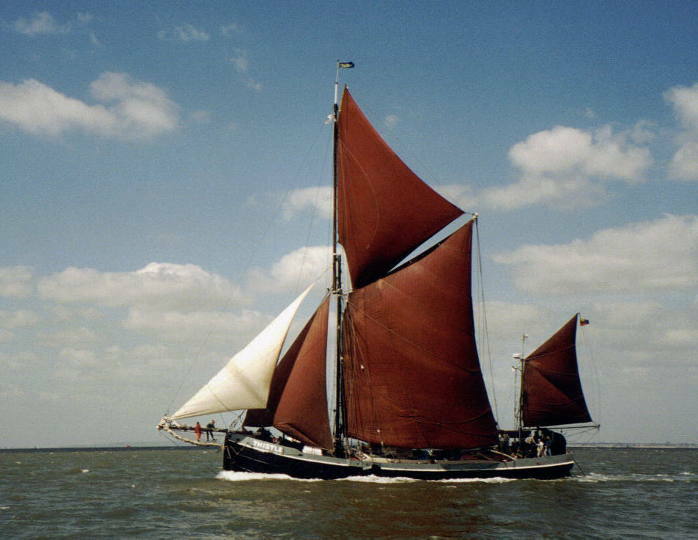 Rerigged as charter barge by Roger Beckett of Anglian Yacht Services for chartering out of Maldon Owned by Reminder (1929) Ltd Managed by Topsail Charters. Off white hull, Based Maldon. 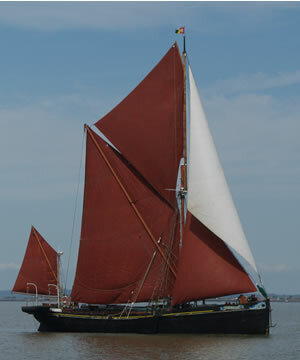 REPERTOR of Harwich, STAYSAIL Class ('Bob' - white fish (Pollock) emblem with black 'P' on red ground. 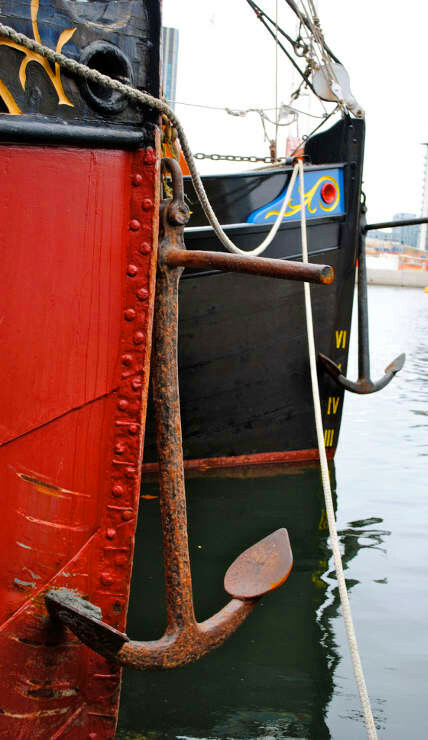 Hull - red-oxide boot-topping, transom and rails; dark-blue/black topsides). Official No.145404. Tons: 69. Built of steel at Mistley in 1924 by Horlock owned by M.R.Horlock. Derigged and converted to motor tanker barge, she was sold out of trade to G.Reeve. Houseboat Battersea, rerigged by C.McLaren in 1978. Owned by David & Elaine Pollock since 1986. 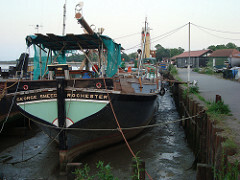 Now based at and chartered from Faversham Reach, on Faversham Creek. Official No.127269. Tons: ?. Built of wood, at Rochester in 1919 by Gill for L.R.T.Co. Unrigged 09/1957. 1977 bought by Steve Mallet and re rigged. 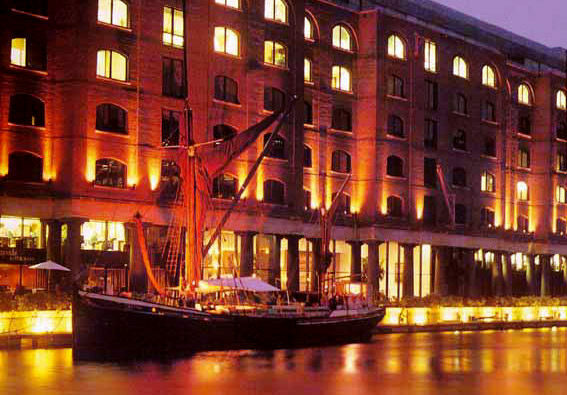 1990's Converted to a restaurant in West India Dock for David Ireland. 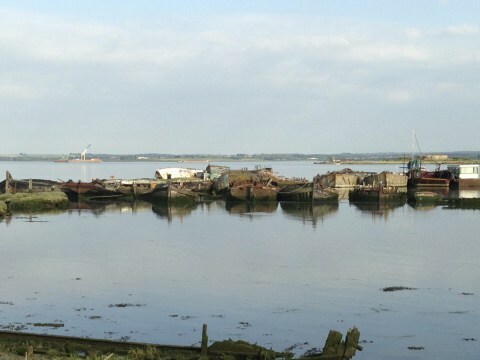 Sunk in 2000, raised and moved to Barking Creek. 2004 owned by J.C. Royer. 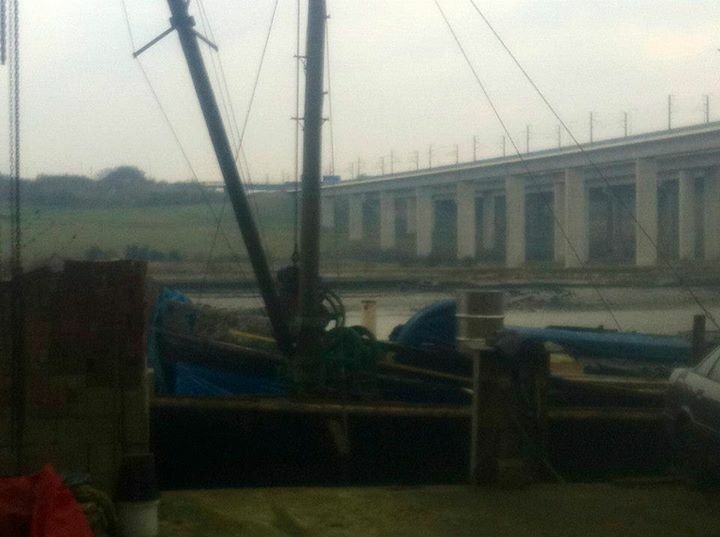 Sold 07/2004 & Laid up Benfleet Creek. Official No.110106. Tons: ?. Built of wood at Sittingbourne by Wills & Packham in 1899. Owned by Rita Bowran as a houseboat at Stargate Marina, Hoo. 2007 hulked Hoo Saltings. Official No.161348. Tons: ?. Built of wood, 43.2 x 13.1 x 4.8., at Rochester in 1901 by Gill for the War Department Owned by G. Winfield as a yacht before becoming an architectural feature on Free Trade Wharf Wapping 1988. Sold 1999 for restoration at Gillingham by Neil Pemble. Continuing 2010. Official No.116179. Tons: 67. Built of wood at Harwich in 1906 by W.B.McLearon 88.9x20.6x 7.1., bought by F.W.Horlock and rigged as boomie. Sold 1917 to Wynfield Shipping Co. of Grimsby who fitted an engine which was removed on sale to Capt.Body in 1923. Later owned by R & W Paul Ltd. aux. Ruston 80 installed 1948. 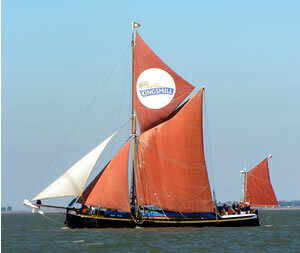 Owners East Coast Sail Trust for youth sail training out of Maldon. 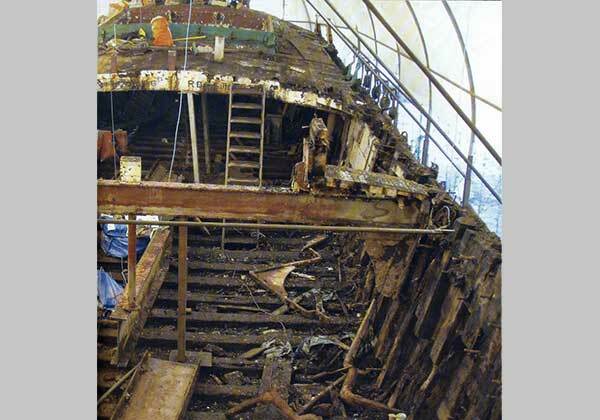 Major rebuild /refit at St Osyth 2005. 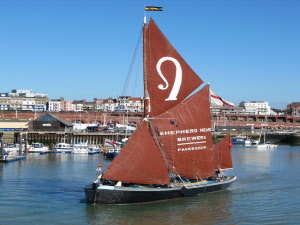 Rerigged and sailing again from March 2012. Based Maldon. Official No.105727. Tons: 82. Built of steel at Port Glasgow in 1895 by Hamilton. and traded with H.Covington & L.R.T.C.with Kelvin auxilliary installed 1948. Housebarge at Battersea, rerigged Greenwich 1988 by C.Maclaren 2001 Owned Thistle (1895) Ltd. Charter barge with Topsail Charters Ltd. Maldon. Half wheelhouse. Based Ipswich. Overwinters at Maldon. Official No.110315. Tons: 70. Built of wood at Sandwich in 1901 by H.Felton, 84.2 x 20.4 x 6.6. Owners, Fisher, bought by R & W Paul Ltd 1912. Motorbarge '50. 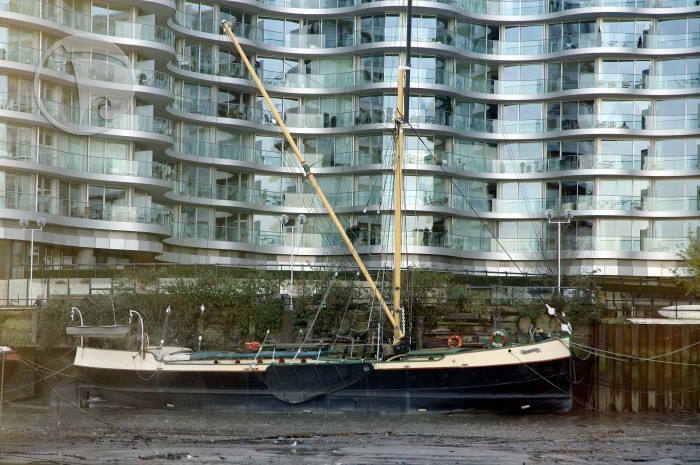 sold as a yacht by '65 and housebarge at Pin Mill '78. Rebuilt Ipswich Dockend 1992 , moved to London, Owned by David Paling as a Bar Millwall Dock. For sale 2004. 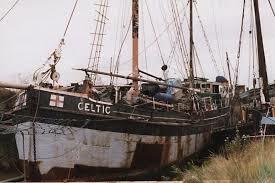 Sunk at her berth Sept 2005, raised laid up Fresh Wharf Estate, Barking Creek 2010. Official No.116176. Tons: 73. Built of wood at Ipswich in 1904 by Orvis & Fuller. Owned by Alfred Horlock and converted to a yacht in 1932. 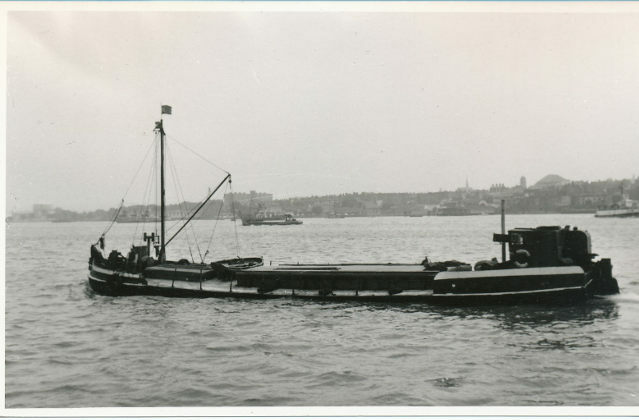 Sold back into trade and converted to motor barge by Whiting Bros. Passed to L.R.T.C. Owned by Dawes, Thomas and Martin. as private barge yacht until sold to Ms. Lynn Johnson & Graham Head late 1997 and now based at Woodbridge, Suffolk. moved to St Osyth 2004. Sold and moved to Topsham Devon 2012. Official No.96482. Tons: 45. Built of wood at Maldon by Howard in 1899. 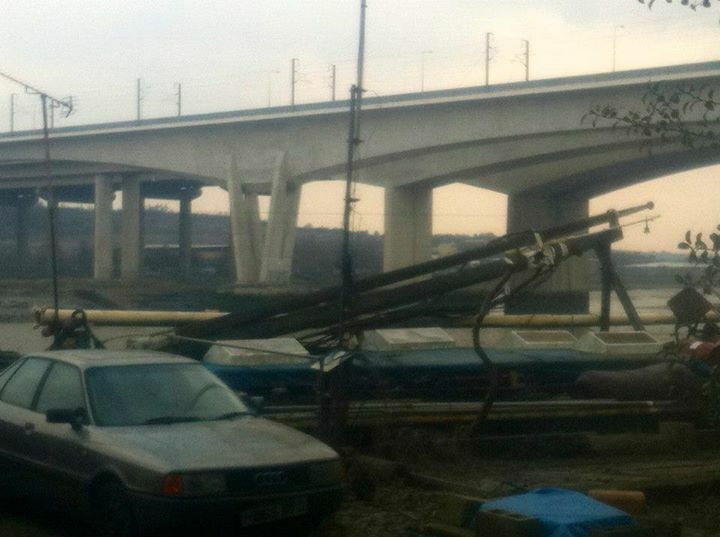 Owned by Robert Boakes based at Brambletree Wharf, by the New Medway Bridge. (Located in a steel lighter 2010). Official No.112733. Tons: 43. 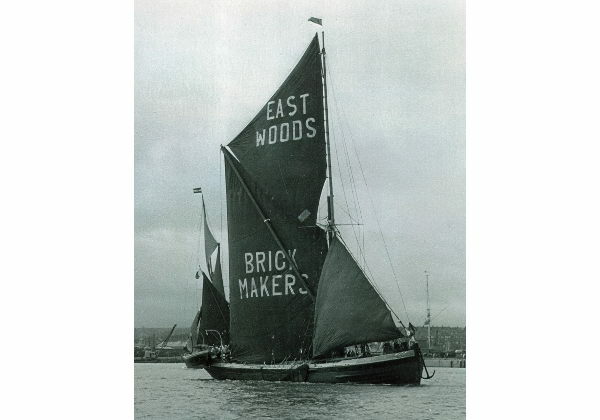 Built Conyer 1900 by White, 79 x 17.1 x 5. for Eastwood Ltd, the brickmakers who donated her to the Thames Barge Sailing Club in 1963. 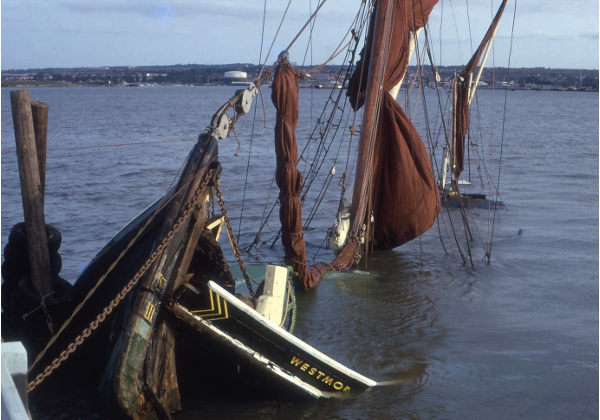 Wrecked at Hoo 1973 she was acquired by Colin Frake. Rebuilding at Faversham. Continuing 2010. Official No.SR No; 10246. Tons: 29.5. 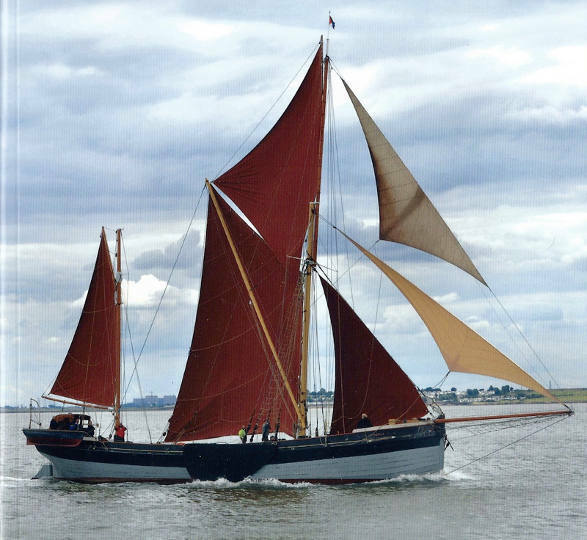 Built London 1905 by Humphrey & Grey as a steel bonded spirit barge (unrigged) Converted to swim headed, tiller steered, gaff rigged sailing barge by Reg Coombes.mid 70's.Sold to Owen Emerson 2002 for conversion to spritsal barge with wheel steering, straight stern and aux. engine. Based Lower Upnor. Official No.149696. Tons: 98. Built of steel at East Greenwich by Piper in 1926. Converted to a wine bar 1984. Sailing gear removed 1993. Now a static night club at Victoria Embankment, near Waterloo Bridge. Official No.148677. Tons: 150. Built of steel at Yarmouth in 1925 by Fellows as the Will Everard for F.T.Everard & Co. Ltd. Sold as motorbarge out of trade and rerigged. Owners, V.S.Harvey, 1966; J.R.Hobbins, 1971; Overseas Containers Ltd (P & O) 1977 and sold 1998 to skipper Sue Harrison. Sold to Mark Towers 2004 Mule rigged yacht barge, blue hull. Based St Katherines. 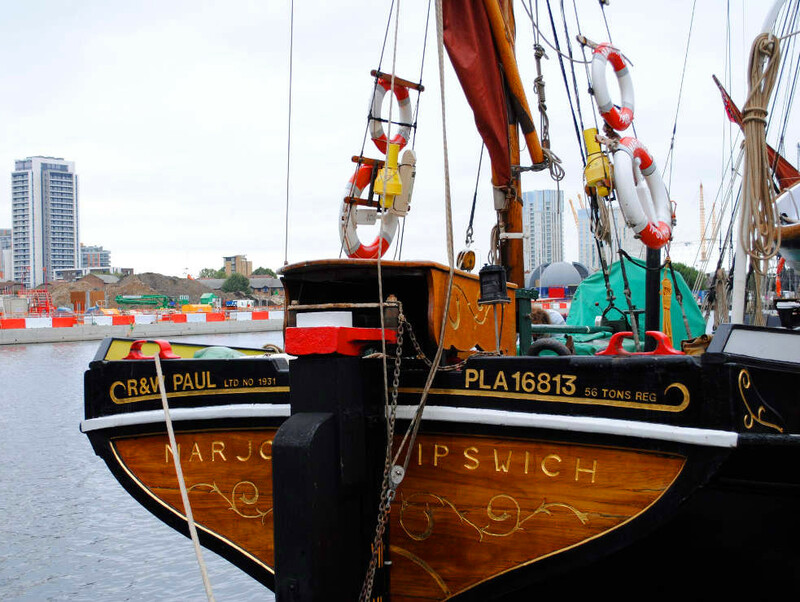 She is based at West India Dock. 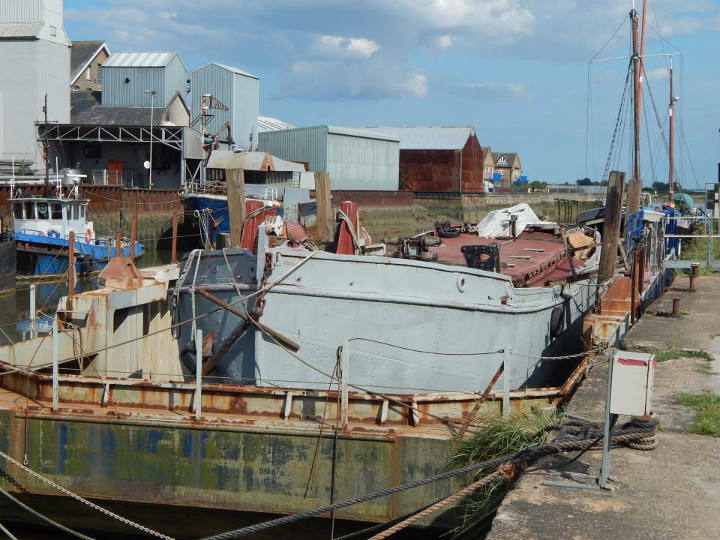 Currently (2017) owned by Tim Kent, used for film work and now in Limehouse Basin, London for sale as a potential house boat. 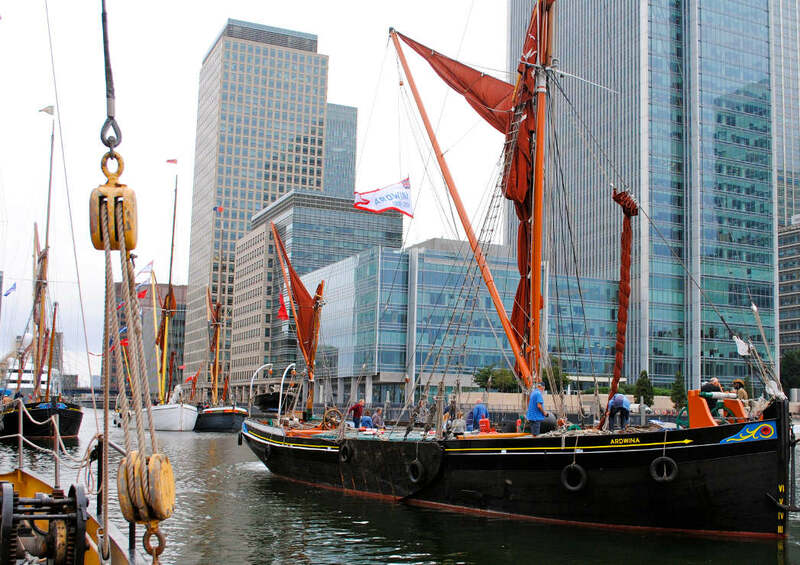 Thames Sailing Barges and its community have a heritage that dates back through to the Industrial Revolution, when the barges helped to build Victorian London and other areas of Britain. Though known as the juggernauts of the river at that time and instrumental in Britain's economical raise, today they do not hold an official heritage stamp recognised by the British establishment which does cause them problems receiving institutional funding. 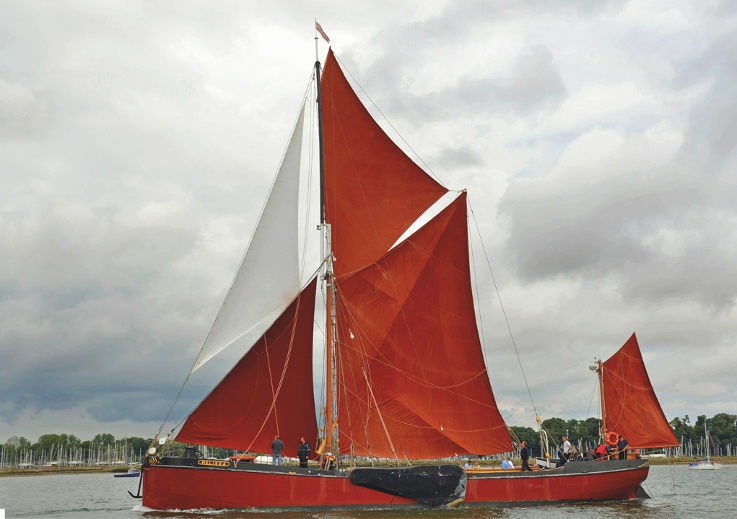 The Thames Sailing Barge Foundation (TSBF) the non-profit organisation established to raise the declining profile of the barges is seeking to get the barges officially recognised as part of British Heritage, but it is a mammoth task that will need funding in itself. Profile’s of the barges was waning because of lack of publicity, but we hope to fix this through the marketing ability of the parade event, however, this fundraiser does cost, so the more we can get in the public-eye, the better it will be in the long term for the barges. 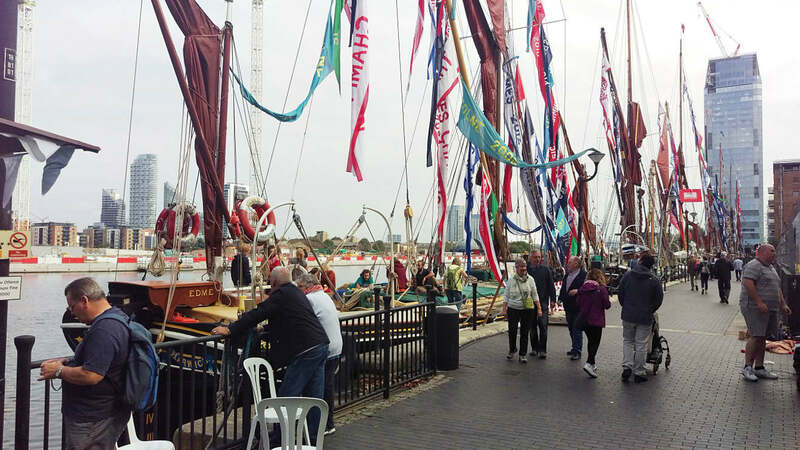 Having a greater public presence and image will help the barges, the community and the foundation to better secure future funding for repairs, maintenance and restoration work amongst other things, such as funding and building the community too. 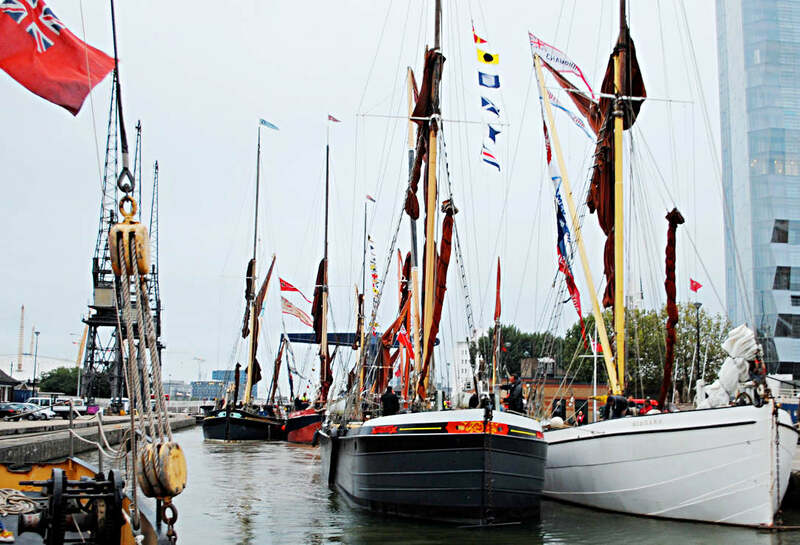 By being in the public eye, through putting on a spectacular show for the visiting crowds, this will go a long way to keeping the barges and its community alive. 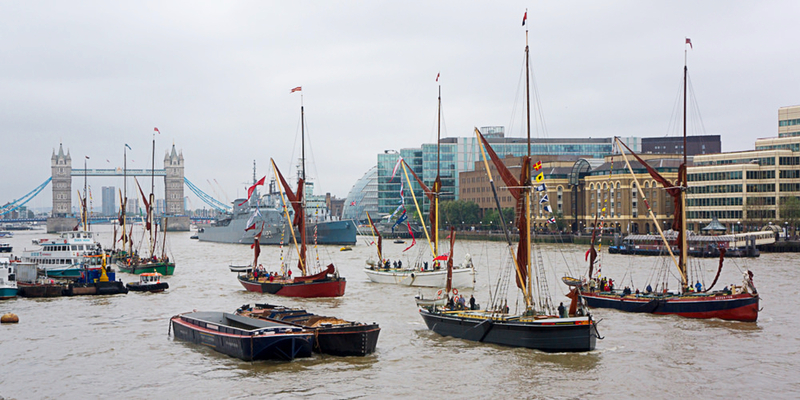 Thames Sailing Barge Parade is an event established for Thames Sailing Barge Foundation which is a Non-Profit Organisation. We value all monetary donations, but there are those who prefer to donate by volunteering time. If you are one of those who like to be hands on and see your contributory efforts transform in front of your eyes, then this is the type of donation for you and we welcome it with joy. We can't get enough hands on contributors to help with loads of menial tasks that have to be carried on in the pursuit of maintenance. You get to come out sailing with us. You'll spend time socialising around the dinner table below deck and the skipper may even supervise you at the helm, how cool is that. So, what are you waiting for... we're now waiting for you. Just fill in the form and give us any extra details, if you need to. 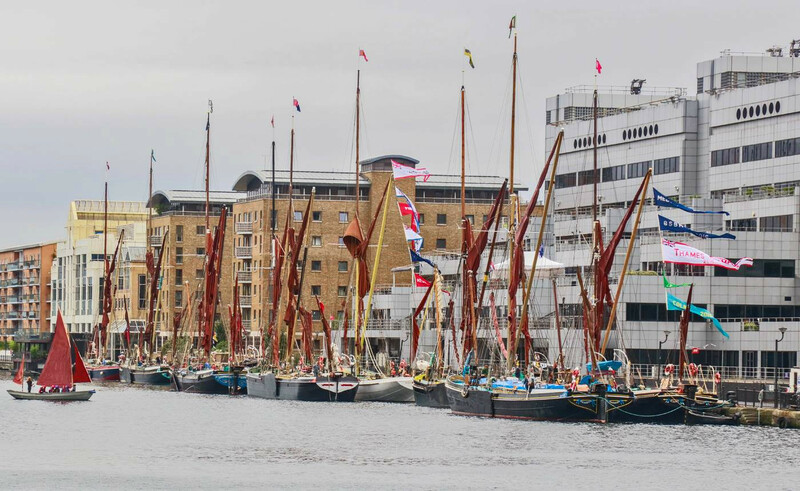 When the barges are back from the parade and moored at West India Docks, the public will be treated to more shoreside entertainment at our hospitality area there, with to-scale 'Model - Thames Sailing Barges', in a model barge match. We're sure it's going to be thrilling, but we know, you are going to be facinated. You may ask, “Why are Totally Thames here and who are they”? We should reply, "watch it, they're great friends of ours". And we'll say, "We wouldn’t be here without them. Period." If you know anything about Her Majesty The Queen and you saw her extraordinary Jubilee Pageant in 2012, then you are closer to knowing Totally Thames than you think. 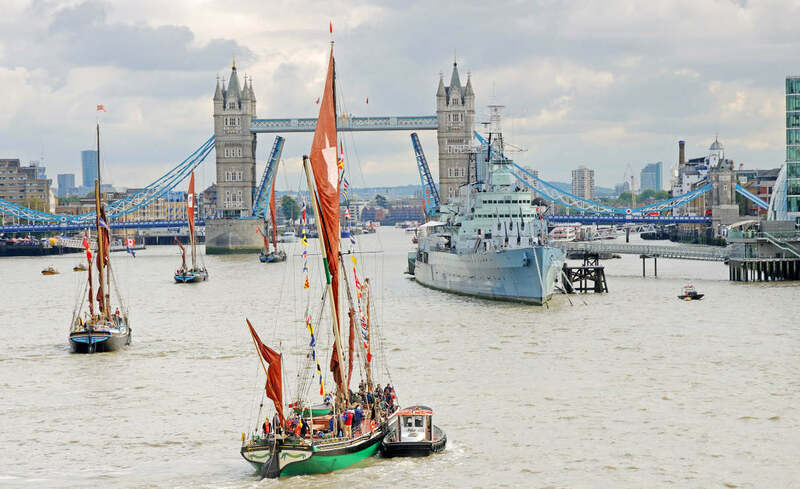 Totally Thames is run by Thames Festival Trust and the director of that trust is, none other than, the pageant master to The Queen's Jubilee Pageant 2012, Adrian Evans. 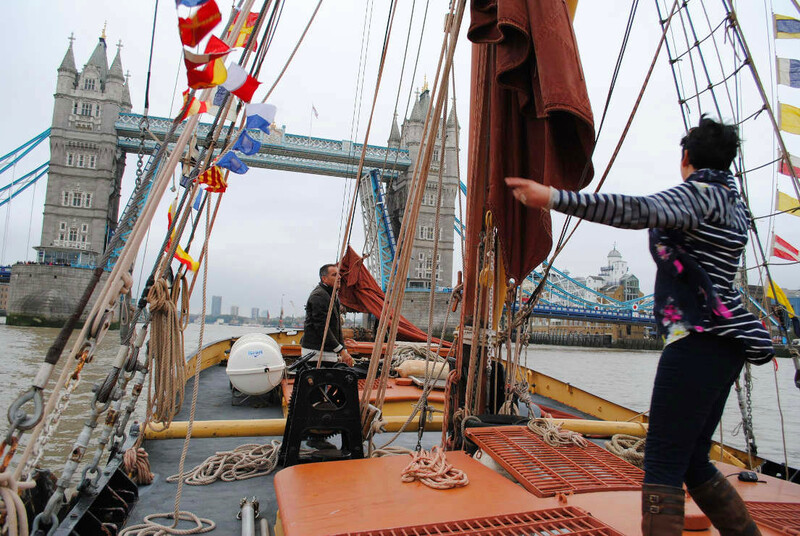 In the month of September, Totally Thames celebrates London’s river from the 1st-30th with events galore. 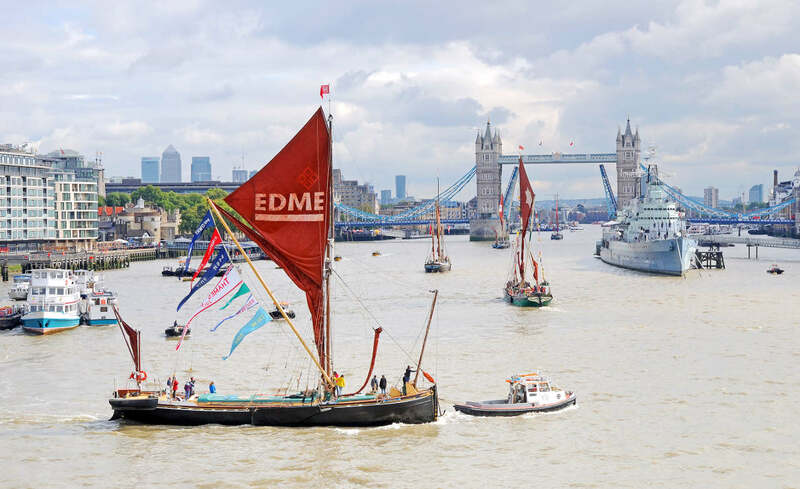 Adrian Evans wants to revitalise people’s passion for the river and make it a theatre again, as it once was, which is why we are going to help him do that with the Thames Sailing Barge Parade. Totally Thames are helping to give us the public profile we seek for our maintenance and restoration program and Totally Thames get another great event to fill their agenda. It is through Adrian Evans himself, that we were first given the platform we have, to perform our spectacular parade, so we thank him and the trust, very much. Thank you. This is why Totally Thames are here. Please fill in as much detail as you can, it will improve our chances of getting a communication going with the lead. Your support in this small way will be a huge help to us and it will be greatly appreciated as we really do need all the help we can get. 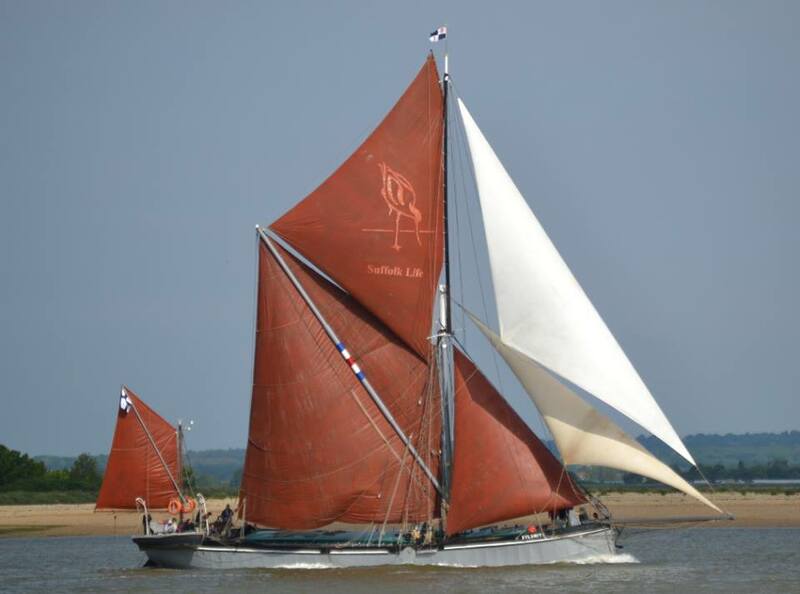 Copyright © Thames Sailing Barge Foundation (TSBF) 2015. All Rights Reserved. 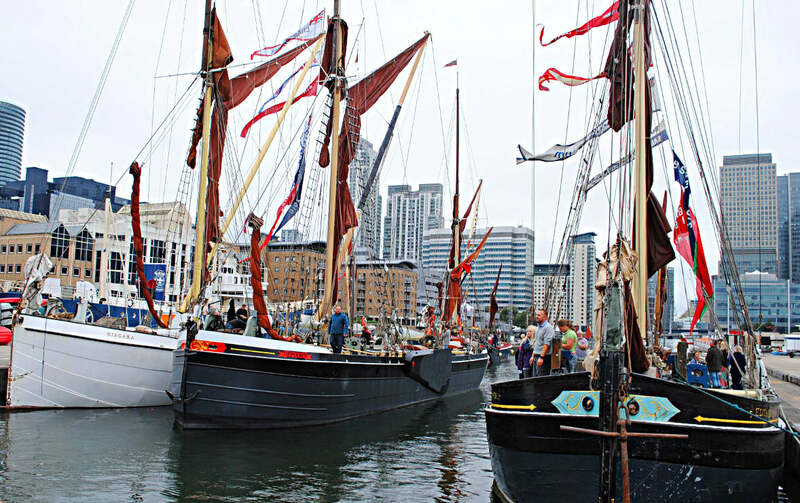 Thames Sailing Barge Parade & Popup Museum (TSBP) are charitable campaigns established by Thames Sailing Barge Foundation — a non-profit charitable organisation.